No attachments. 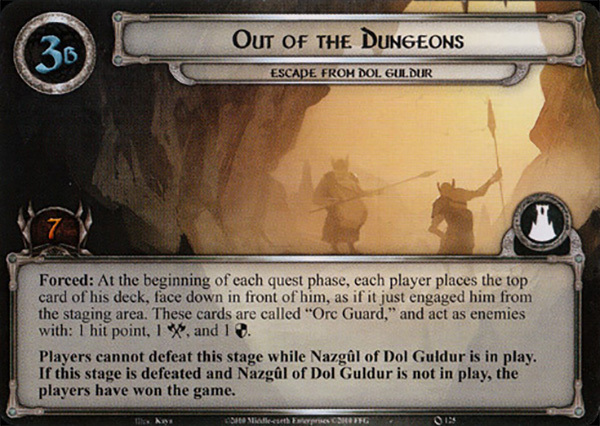 Forced: When the prisoner is 'rescued', move Nazgûl of Dol Guldur into the staging area. 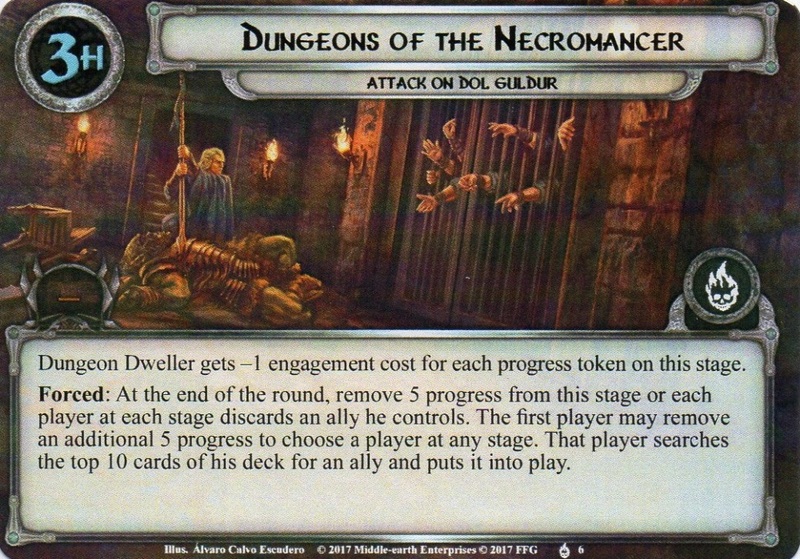 Forced: After a shadow effect dealt to Nazgûl of Dol Guldur resolves, the engaged player must choose and discard 1 character he controls. Cannot have non-Morgul attachments. Forced: After Nazgûl of Mordor attacks, either raise your threat by 4, or return Nazgûl of Mordor to the staging area. Cannot have non-objective player card attachments or take non-combat damage. Forced: After Nazgûl of Dol Guldur attacks you, eithe return it to the staging area or raise your threat by 3. Immune to player card effects, Cannot take damage. X is the number of resources on Stalking the Ruins. Forced: When Naurlhûg makes an attack, the defending player assigns X damage among characters he controls. Immune to player card effects. Forced: When Naurlhûg's Lair is explored, add the Loot objective from underneath Stalking the Ruins to the staging area faceup. Travel: Place X resources on Stalking the Ruins, where X is the number of players. 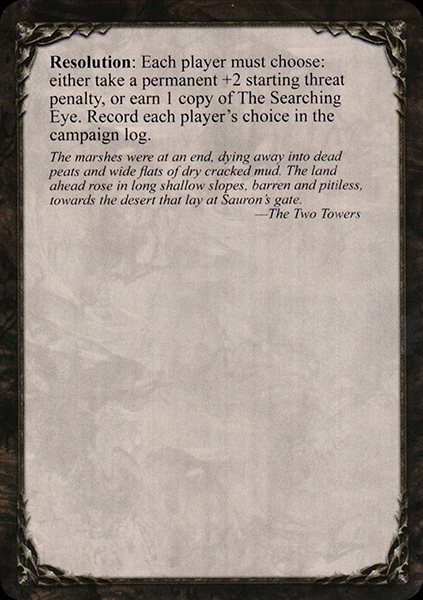 Forced: After Nameless Thing engages a player, attach the top 2 cards of that player's deck to it. X is the printed cost of all attached cards on this card. If there are no cards attached, X is 3. Cannot have player card attachments. X is 1 more than the Discover value on the active location. Shadow: Attacking enemy gets +1 Attack (+2 Attack instead if you control a Loot objective). Attach to a Dwarf hero. Action: Exhaust Narvi's Belt to give attached hero a Leadership, Lore, Tactics, or Spirit icon until the end of the phase. Resources in Na'asiyah's resource pool cannot be used to pay for allies. Action: While Na'asiyah is attacking or defending, pay 1 resource from her resource pool to give her +2 Attack or +2 Defense for this attack. The first player gains control of Nalir. Forced: At the beginning of the refresh phase, raise your threat by 1 for each player in the game. If Nalir leaves play, the players lose the game. Na’asiyah engages the last player. Forced: When Na’asiyah engages you, discard each event in your hand. Add 1 resource to Na’asiyah for each event discarded in this way. Forced: When Na’asiyah attacks or defends, she gets +1 Attack and +1 Defense for this attack for each resource on her. After this attack, discard 1 resource from her. The last player gains controls of Na'asiyah. Action: While Na'asiyah is attacking or defending, spend 1 resource from her to give her +2 Attack or +2 Defense for this attack. Action: Spend 1 resource from a hero you control to place 1 resource on Na'asiyah. (Limit once per round). If Na'asiyah leaves play, the players lose. Immune to player card effects. Reduce the cost of the first ally you play each round by 1. If the Nárelenya is destroyed, its controller is eliminated from the game. Response: After the player travel here, choose a non-unique enemy engaged with a player and place it faceup under this location. While an enemy is under this location, that enemy is considered to be out of play. Forced: After Narrow Alleyway leaves play, put each enemy under it into play, engaged with the first player. When faced with the option to travel, the players must travel to Narrow Stair. Shadow: Until the end of the round, defending character cannot be readied by player card effects. Each Dark location in play gets +2 quest points. While Cave Torch is ready, progress cannot be placed on Narrow Fissure. While Narrow Ledge is the active location, each player cannot commit more than 3 characters to the quest. Shadow: Shuffle all copies of Galloping Boulders from the encounter discard pile into the encounter deck. Immune to player card effects. Forced: After the first player plays an ally from his hand, deal 1 damage to the Nárelenya. Attach to a hero. Attached hero gains sentinel. Action: Pay 1 resource from attached hero's pool to attach Dunedain Signal to another hero. While there is a side quest in the victory display, Vigilant Dúnadan does not exhaust to defend. Forced: At the end of the round, deal 1 damage to Annúminas for each enemy at each stage. If the city strength of Annúminas reaches 0, the city is overrun by the forces of Angmar and all teams lose the game. 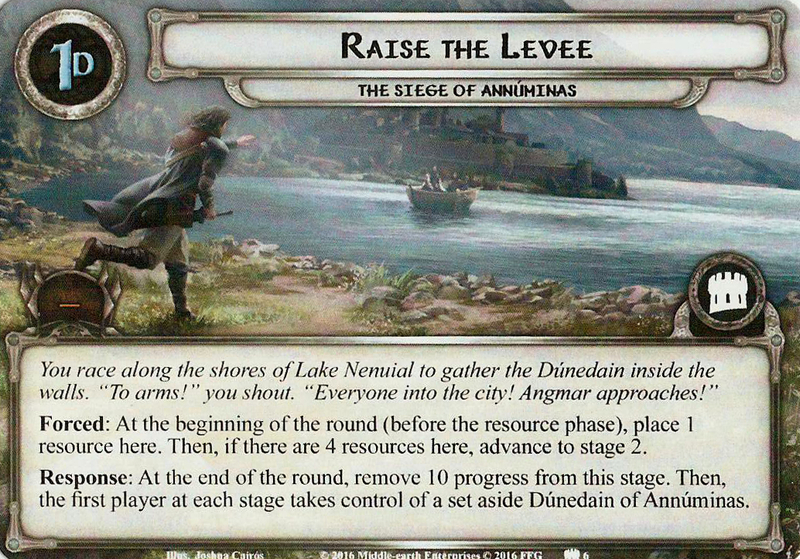 When Revealed: Any player may spend 1 resource to take control of Dúnedain of Annúminas. Otherwise, discard it. Shadow: Ready the defending character and give it +2 Defense for this attack. When Revealed: Starting with the first player, each player must choose 1 Goblin enemy from the discard pile and add it to the staging area. Shadow: Defending player deals damage among characters he controls equal to the number of Goblin enemies engaged with him. X is 1 more than the number of enemies in play. Travel: Each player engages an enemy in the staging area to travel here. Forced: After Elder Nameless Thing engages a player, attach the top 3 cards of that player's deck to it. X is the printed cost of all attached cards on this card. If there are no cards attached, X is 4. 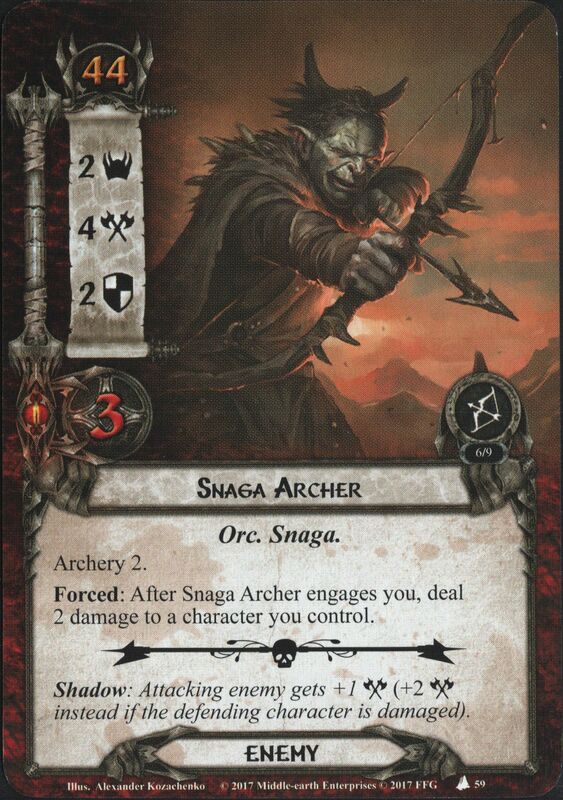 Forced: After Snaga Archer engages you, deal 2 damage to a character you control. Forced: After the players travel to a location, Tunneling Nameless Thing engages the first player. If there is no active location, return Tunneling Nameless Thing to the staging area. Cannot have non-Morgul attachments. Forced: After The One Ring is exhausted, Menacing Weath engages the first player and makes an immediate attack. 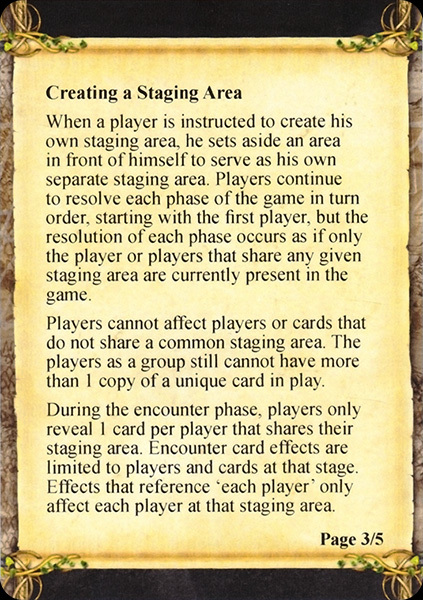 New Staging Rules When playing The Old Forest, players reveal encounter cards individually in player order during the Staging step of the Quest phase. If an encounter card has and effect that uses the word 'you' then the encounter card is referring to the player who revealed the card. If the revealed card has the Surge keyword, the player who revealed it reveals an additional card card. Encounter cards with the Doomed X keyword still affect each player. 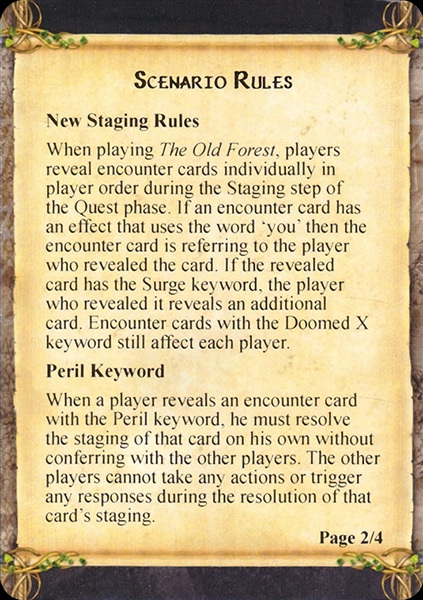 Peril Keyword When a player reveals an encounter card with the Peril keyword, he must resolve the staging of that card on his own without conferring with the other players. 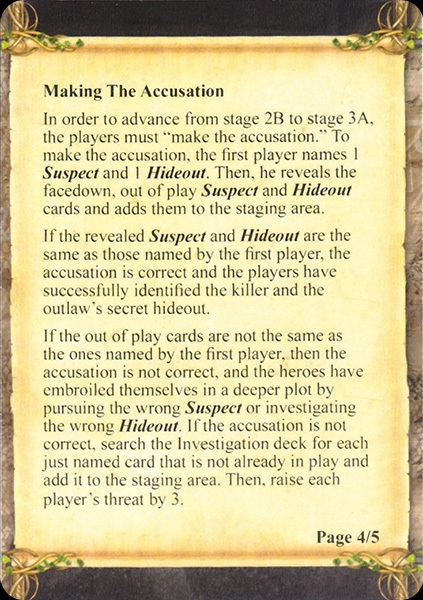 The other players cannot take any actions or trigger any responses during the resolution of that card's staging. Stage 2 Quest Cards When Stage 2B instructs the players to advance to a different random stage 2A, the first player shuffles each stage 2 (except for the one currently in play) together and chooses one of them at random. Then, he replaced the current stage 2 with the chosen one. The previous stage 2 is placed back in the quest deck with the other unused stage 2 cards. Discard any progress or attachments that were on the previous stage 2. Immune to Player Card Effects Cards with the text 'Immune to player card effects' ignore the effects of all player cards. 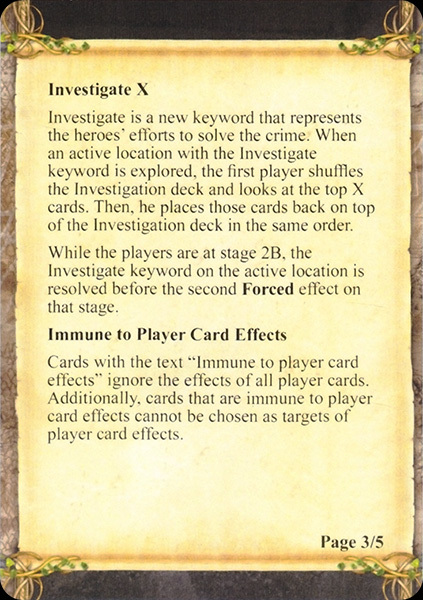 Additionally, cards that are immune to player card effects cannot be chosen as targets of player card effects. Indestructible An enemy with the indestructible keyword cannot be destroyed by damage, even when it has damage on it equal to its hit points. Response: After a Silvan ally you control leaves play, ready Defender of the Naith. Veteran of Nanduhirion enters play with 1 damage on it. Attach to a Leadership hero. Reduce the cost to play Tome of Atanatar by 1 for each hero you control with a printed Leadership resource icon. Action: Discard Tome of Atanatar to play any Leadership event card in your discard pile as if it were in your hand. Then, place that event on the bottom of your deck. Lindon Navigator does not exhaust to commit to a quest, and can commit to quests while exhausted. Forced: After resolving a quest to which Lindon Navigator was committed, either discard it from play or discard 1 card from your hand. Immune to player card effects. The Nameless Fear cannot engage or be engaged. X is the number of victory points in the victory display. 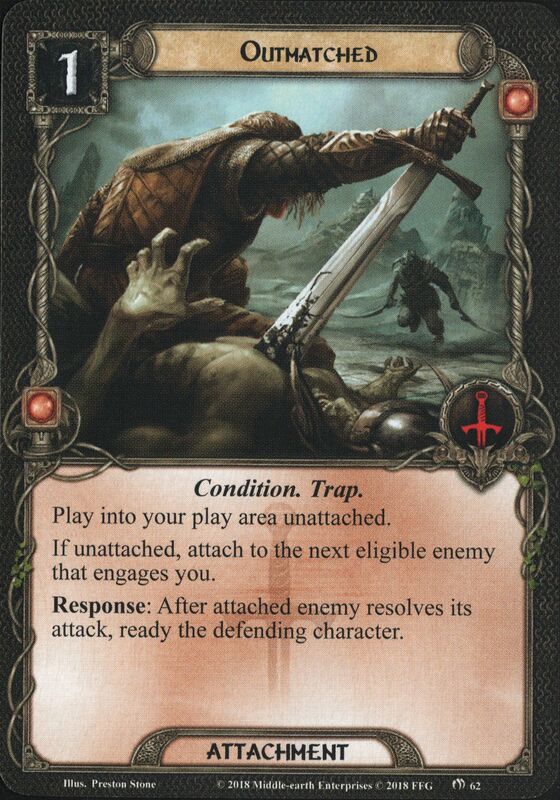 Allies cannot defend against Lieutenant of Mordor.When Revealed: Resolve the 'when revealed' effect on the topmost treachery card in the encounter discard pile, if able. This effect cannot be canceled. Forced: When Telemnar's Bane attacks, discard the top 3 cards of each player's deck. Forced: After a player plays an event card, Telemnar's Bane makes an immediate attack against the first player. Action: Exhaust Amarthiúl or a hero to claim Daechanar's Brand. Then, attach Daechanar's Brand to that character. Attached character gets +1 Attack while attacking undead enemies. Cannot have attachments. Daechanar gets +1 Attack for each Sorcery card in play, and gains indestructible while at least 1 Sorcery card is in play. Forced: When Daechanar is damaged, if there is at least 1 Sorcery card in play, cancel all damage just dealt and remove a Sorcery card from the game. Immune to player card effects. X is the number of players in the game. The players cannot travel here while Sarn Gebir is in play. While The Argonath is the active location, skip the combat phase. Forced: After Lieutenant of Orthanc attacks and destroys a character, that character's controller discards 1 random card from his hand. When Revealed: Discard 1 random card from your hand. Snaga gets +X Threat until the end of the round, where X is the discarded card's printed cost. Minas Tirith has 30 hit points plus 10 for each player. 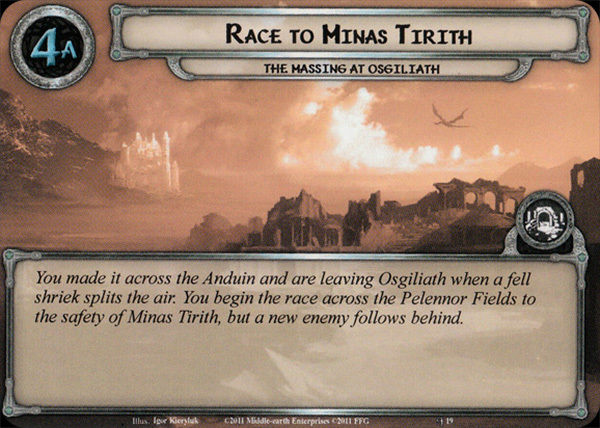 Forced: At the end of the round, deal 1 damage to Minas Tirith for each enemy in the staging area. 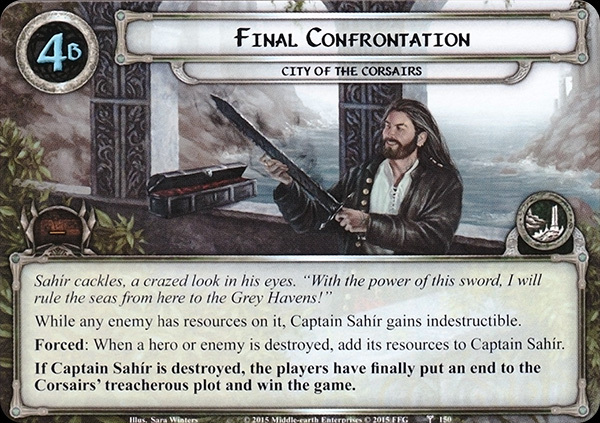 Then, if Minas Tirith has no hit points remaining, the players lose the game. 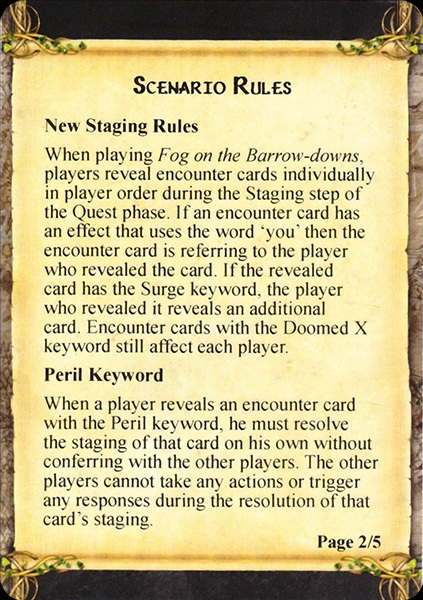 New Staging Rules When playing Fog on the Barrow-downs, players reveal encounter cards individually in player order during the Staging step of the Quest phase. If an encounter card has an effect that uses the word 'you' then the encounter card is referring to the player who revealed the card. If the revealed card has the Surge keyword, the player who revealed it reveals an additional card. Encounter cards with the Doomed X keyword still affect each player. Peril Keyword When a player reveals an encounter card with the the Peril keyword, he must resolve that staging of that card on his own without conferring with ther other players. The other players cannot take any actions or trigger any responses during the resolution of that card's staging. Creating a Staging Area When a player is instructed to create his own staging area, he sets aside an area in front of himself to serve as his own separate staging area. Players continue to resolve each phase of the game in turn order, starting with the first player, but the resolution of each phase occurs as if only the player or players that share any given staging area are present in the game. Players cannot affect players or cards that do not share a common staging area. The players as a group still cannot have more than 1 copy of a unique card in play. During the encounter phase, players only reveal 1 card per player that shares their staging area. Encounter card effects are limited to players and cards at that stage. Effects that reference 'each player' only affect each player at that staging area. Immune to player card effects. Lieutenant of Angmar cannot take damage unless there is at least 10 progress on the main quest. 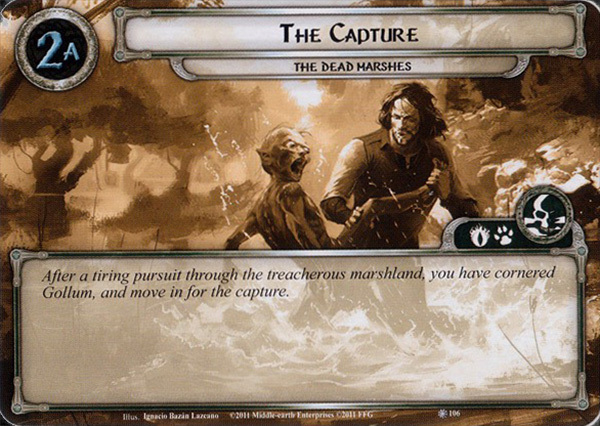 Forced: At the end of the round, Lieutenant of Angmar moves to the staging area with the lowest total Threat and makes an immediate attack against the first player. Shadow: Perform an escape test, dealing 1 card the encounter deck. If this test is failed, discard the defending character. When Revealed: Either discard a random card from your hand, or engage Orc of Minas Morgul and reveal an additional encounter card. Attach to an enemy engaged with a player. Attached enemy cannot attack. Attach to a location in the staging area. Progress from questing successfully may be placed on the attached location before it is placed on the current quest. Travel: The first player must exhaust 1 character he controls to travel here. Shadow: Defending player must choose and exhaust 1 character he controls. When Revealed: Discard the top card of the encounter deck. If the discarded card is a Tentacle enemy, add that card to the staging area and raise each player's threat by 5. Shadow: If attacking enemy is a Guardian, deal it 2 additional shadow cards for this attack. When Revealed: Each player must search the encounter deck or discard pile for a Creature enemy and put it into play engaged with him. Shuffle the encounter deck. This effect cannot be canceled. When Revealed: Each player must either discard 1 card from the top of his deck for each questing character he controls, or remove each character he controls from the quest. When Revealed: If there are less than X locations in the staging area, search the encounter deck and discard pile and add locations to the staging area until there are X locations in staging area. X is the number of players in the game. 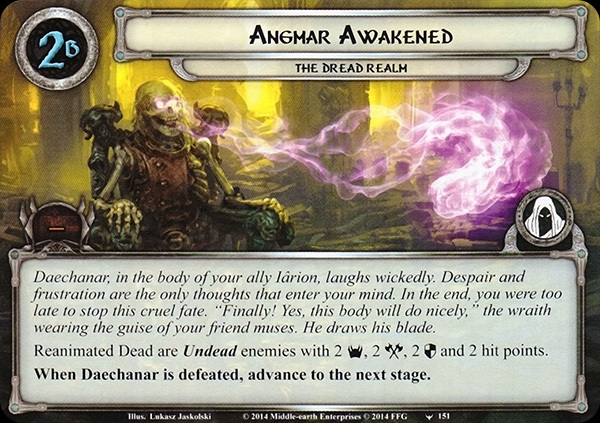 Reanimated Dead are Undead enemies with 2 Threat, 2 Attack, 2 Defense and 2 hit points. Progress that would be placed on this quest is instead placed on locations in the staging area, divided as you choose. Forced: At the end of the phase, if there are any locations in play, deal 1 damage to all characters in play. 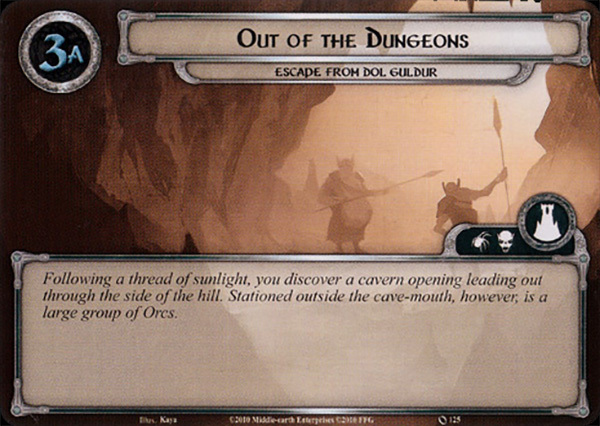 If there are no locations in play, the players have escaped Carn Dûm, and win the game. When Revealed: Search the encounter deck and discard pile for 1 copy of Scouting Ship and add it to the staging area. Shuffle the encounter deck. While you are off-course (Cloudy, Rainy, or Stormy), each Ship enemy gains Boarding 1. When this stage is defeated, if you are on-course (Sunny), look at the top 2 stages of the quest deck and advance to one of your choice, placing the other on the bottom of the quest deck. Otherwise, advance to the top stage of the quest deck. Forced: After Grishnákh enters play, the first player attached 1 of the Captives to him. If Grishnákh is defeated, place the attached Captive faceup underneath To Isengard! Forced: At the end of the quest phase, deal 1 damage to the attached Captive. When Revealed: Add The Witch-king to the staging area. Players have now crossed the Anduin. Players cannot travel to East Bank locations.If the players defeat this stage, they have won the game. Forced: After Jailor Gornákh enters playt each player searches his captured deck for each hero and captures thme underneath Jailor Gornákh. Forced: After a player rescues any number of cards, Jailor Gornákh attacks that player. In the Name of Mordor! Cannot have non-Morgul attachments. 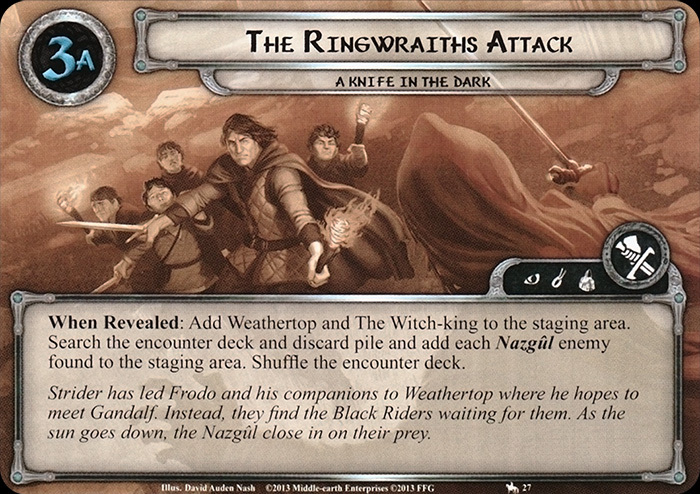 Forced: When Ringwraith attacks, deal it an additional shadow card if The One Ring is exhausted. While City Wall is the active location, damage that would be placed on Minas Tirith must be placed here first. Forced: When City Walls has damage equal to its quest points, discard it. Then, each player raises his threat by 3. Forced: When Unspeakable Thing enages a player or attacks a player, attach the top card of that player's deck to it. X is the printed cost of all attached cards on this card. If there are no cards attached, X is 5. Attach to a hero. Attached hero gains +1 Defense. 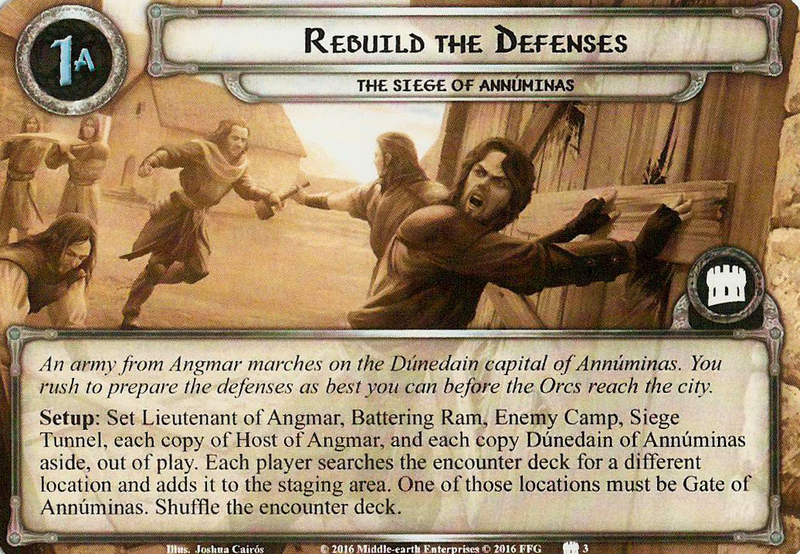 Action: Pay 1 resource from attached hero's pool to attach Dunedain Warning to another hero. Attach to a hero. Response: After Dúnedain Remedy is attached to a hero, heal 1 damage on that hero. Action: Pay 1 resource from attached hero's resource pool to attach Dúnedain Remedy to another hero. Attach to a hero. Attached hero gains +1 Willpower. 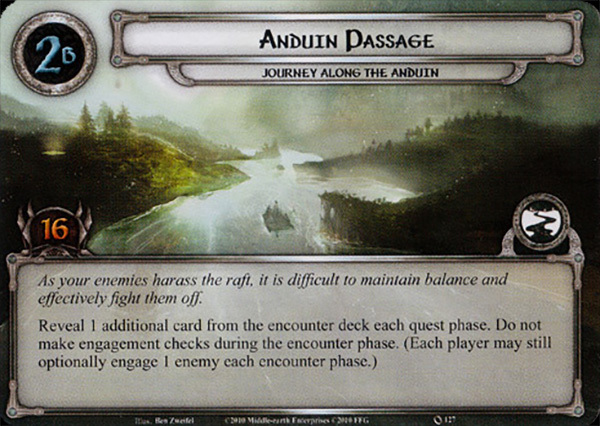 Action: Pay 1 resource from attached hero's pool to attach Dunedain Quest to another hero. Play only if you control a Dúnedain hero. Planning Action: Shuffle 1 of your set aside Ranger of the North allies with the encounter keyword into the encounter deck. Then, remove Ranger Summons from the game. When Revealed: Add Nazgûl of Minas Morgul and The White Bridge to the staging area. When Revealed: Reveal 1 card per player from the encounter deck and add it to the staging area. Nazgûl of Minas Morgul cannot leave play unless destroyed. If Nazgûl of Minas Morgul is defeated, the players have won the game. 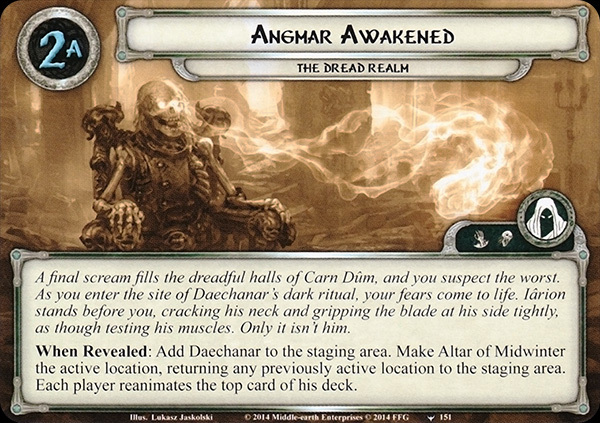 When Revealed: Add Daechanar to the staging area. Make Altar of Midwinter the active location, returning any previously active location to the staging area. Each player reanimates the top card of his deck. Reanimated Dead are Undead enemies with 2 Threat, 2 Attack, 2 Defense and 2 hit points. When Daechanar is defeated, advance to the next stage. When Revealed: Add Weathertop and The Witch-king to the staging area. Search the encounter deck and discard pile and add each Nazgûl enemy found to the staging area. Shuffle the encounter deck. 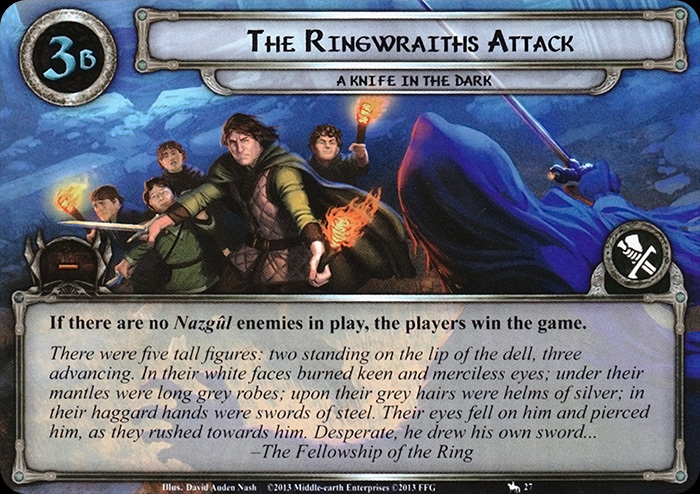 If there are no Nazgûl enemies in play, the players win the game. Cannot have non-Morgul attachments. Forced: After engaged player fails a Hide test, Black Rider makes an immediate attack. Cannot have non-Morgul attachments. 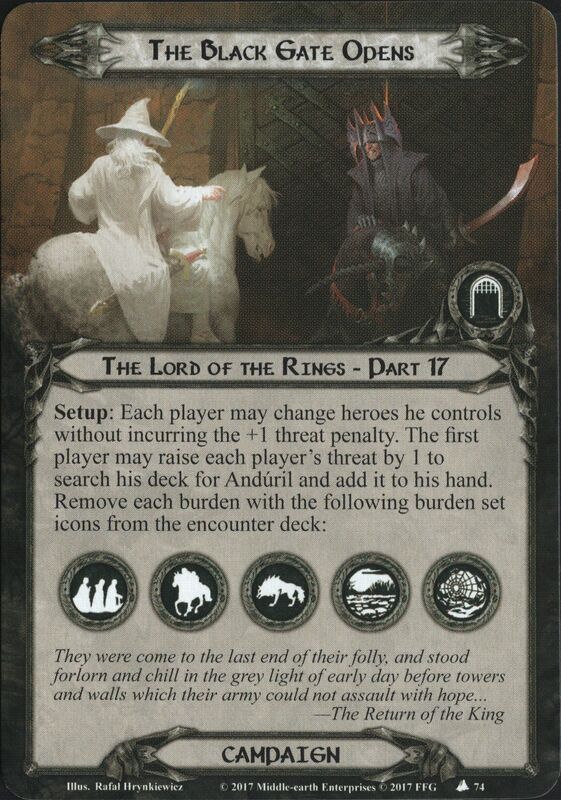 While Rider of Mordor is engaged with a player, characters that player controls get -1 Willpower. 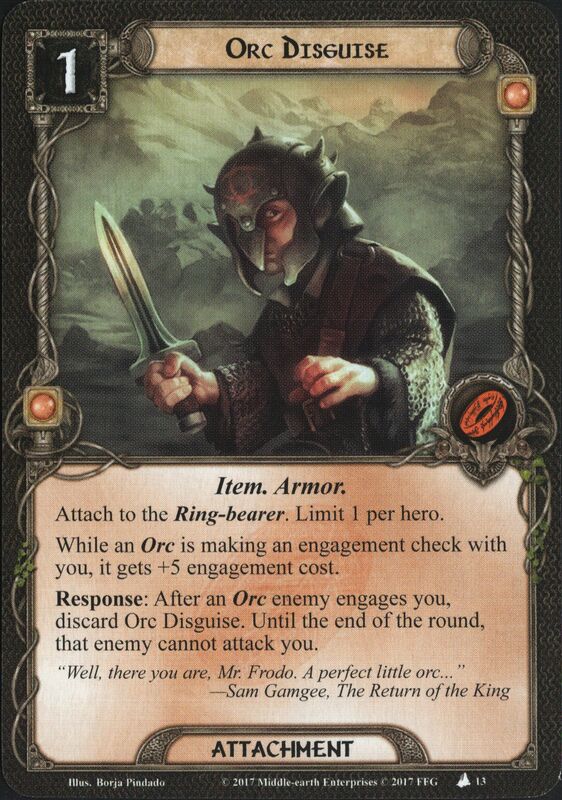 While The One Ring is exhausted, Rider of Mordor gets -10 engagement cost. Cannot have non-Morgul attachments. While Fell Rider is in the staging area, it gains: "Forced: At the beginning of the encounter phase, the first player must either reduce the Ring-bearer's life by 1 or engage Fell Rider." Immune to player card effects. The Witch-king gets -30 engagement cost while The One Ring is exhausted. Characters with 1 Willpower or less cannot defend attacks made by The Witch-king. Setup: Set Frodo's Choice, Seat of Seeing, and Parth Galen aside, out of play. 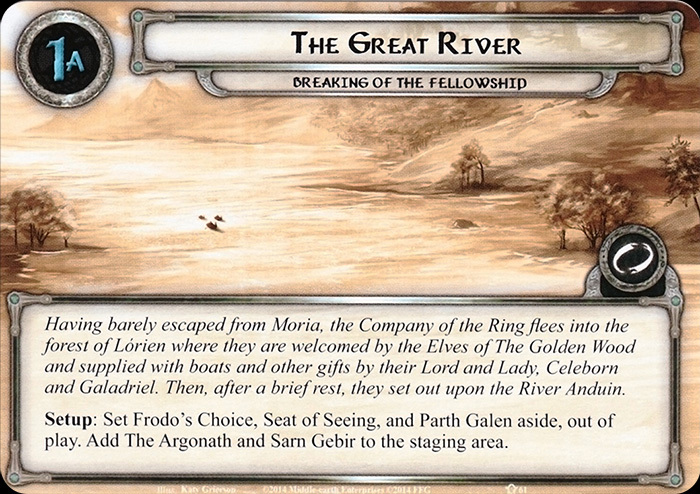 Add The Argonath and Sarn Gebir to the staging area. Enemies get +2 Defense and cannot be engaged. Skip the encounter phase. The players cannot advance while The Argonath is in play. Immune to player card effects. 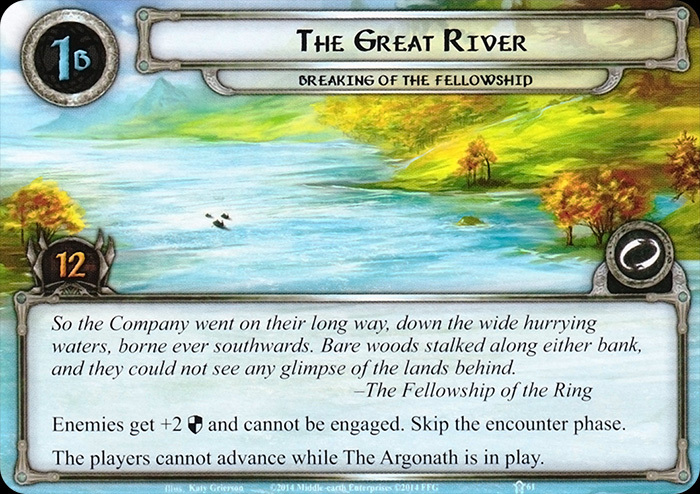 While Gate of Gondor is the active location, each enemy in play gets -30 engagement cost. Forced: When Gate of Gondor is explored, return each engaged enemy to the staging area. Only the engaged player can declare attackers against the Witch-king. Forced: At the beginning of the encounter phase, The Witch-king engages the first player. Then, it makes an immediate attack. 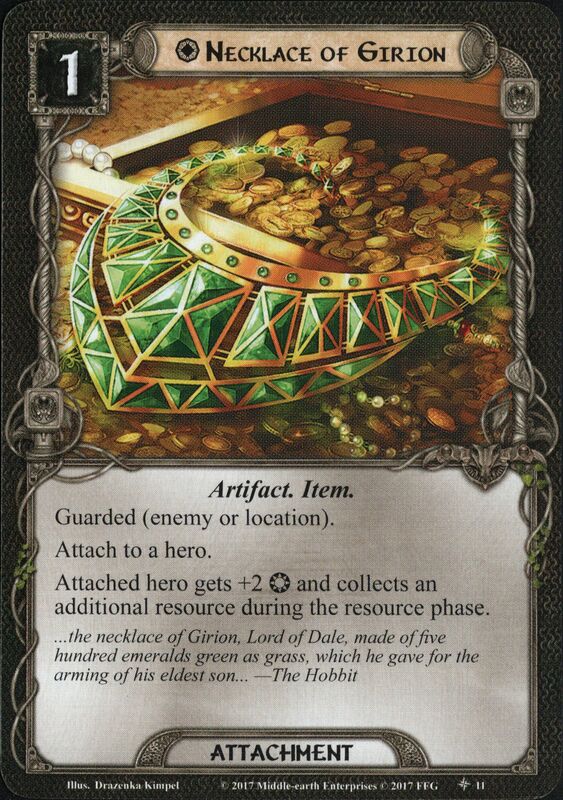 Resolution: Record the number of resource tokens on The Black Gate in the notes section of the campaign log. 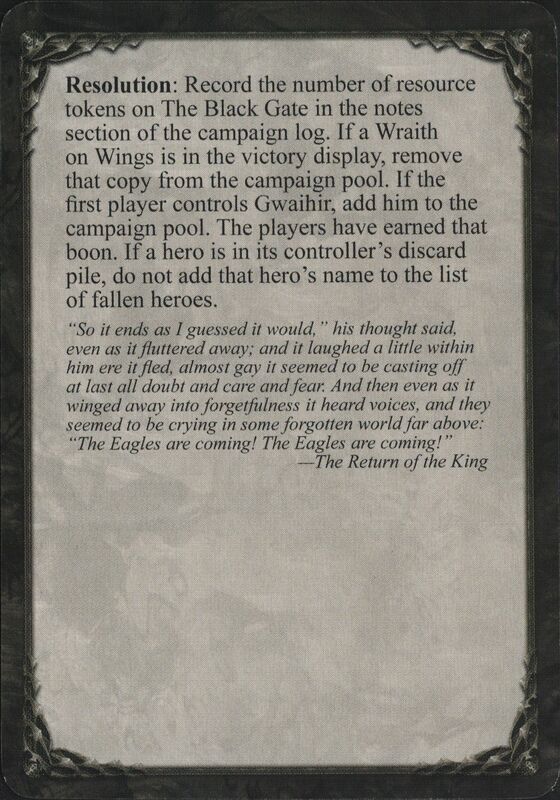 If a Wraith on Wings is in the victory display, remove that copy from the campaign pool. If the first player controls Gwaihir, add him to the campaign pool. The players have earned that boon. If a hero is in its controller's discard pile, do not add that hero's name to the list of fallen heroes. Setup: Create two separate staging areas: one for The Black Gate Opens and one for Mount Doom. Divide the players into 2 teams, one for each scenario. 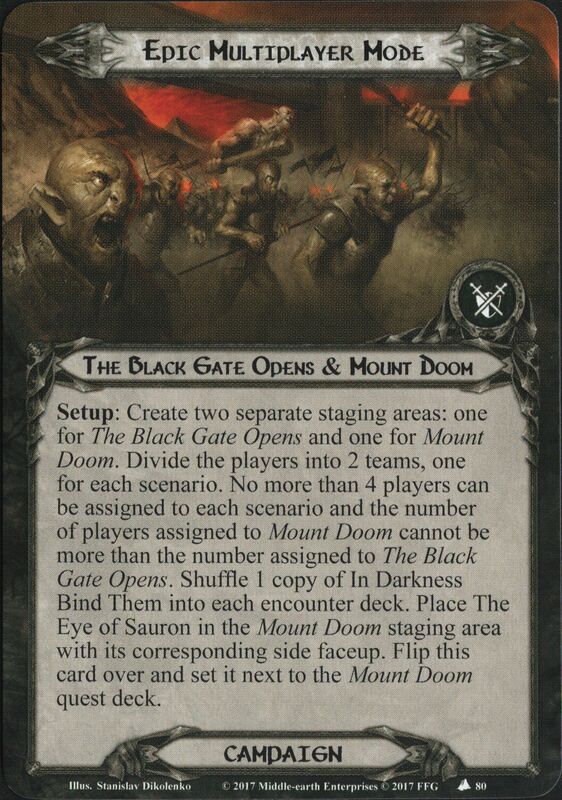 No more than 4 players can be assigned to each scenario and the number of players assigned to Mount Doom cannot be more than the number of assigned to The Black Gate Opens. Shuffle 1 copy of In Darkness Bind Them into each encounter deck. Place The Eye of Sauron in the Mount Doom staging area with its correspdonding side faceup. Flip this card over and set it next to the Mount Doom quest deck. Ignore the Forced effect on the Mount Doom campaign card if it is in play. 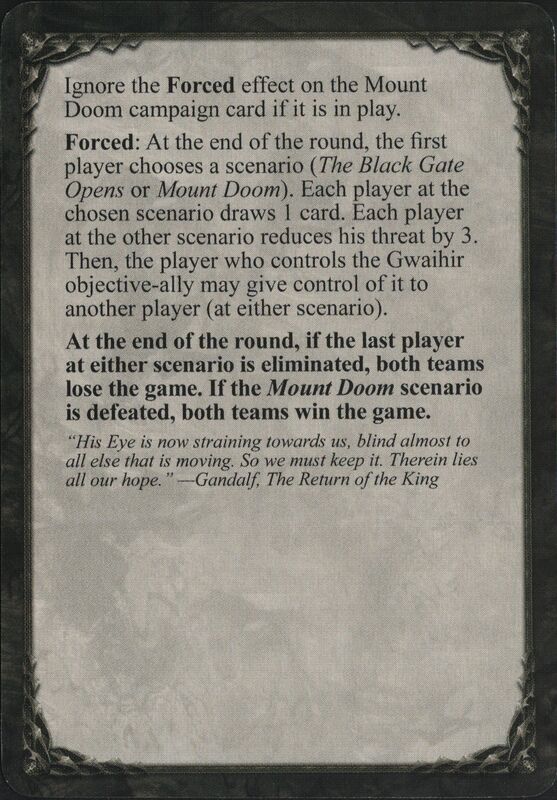 Forced: At the end of the round, the first player chooses a scenario (The Black Gate Opens or Mount Doom). Each player at the chosen scenario draws 1 card. Each player at the other scenario reduces his threat by 3. Then, the player who controls the Gwaihir objective-ally may give control of it to another player (at either scenario). At the end of the round, if the last player at either scenario is defeated, both teams lose the game. If the Mount Doom scenario is defeated, both teams win the game. Stage 3B - Lost in the Fog Stage 3B (and its staging area) must remain in play until it is defeated. If there are no players at stage 3B, skip each phase at that stage. Combining Staging Areas When a player is instructed to combine staging areas with another staging area, each enemy and location card in that player's staging area is added to the other staging area. Enemies engaged with a player remain engaged with him. Immune to Play Card Effects Cards with the text 'Immune to player card effects' ignore the effects of all player cards. 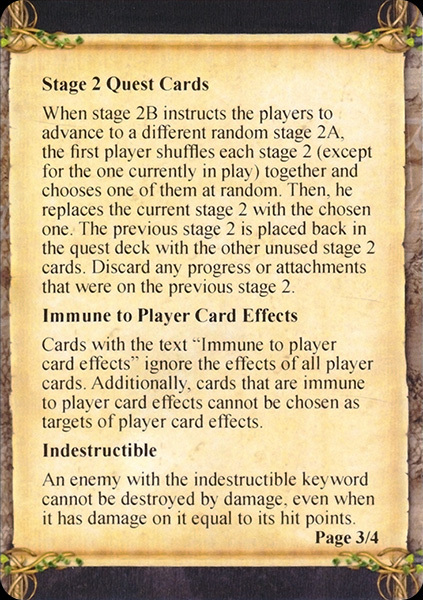 Additionally, cards that are immune to player card effects cannot be chosen as targets of player card effects. Campaign Mode Fog on the Barrow-downs can be played as part of The Lord of the Rings campaign. 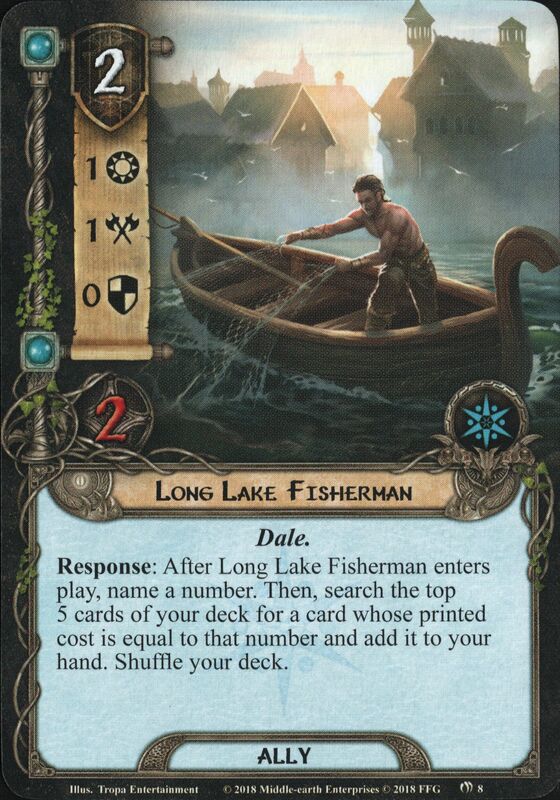 It should be played before A Knife in the Dark, found in The Black Riders Saga Expansion. 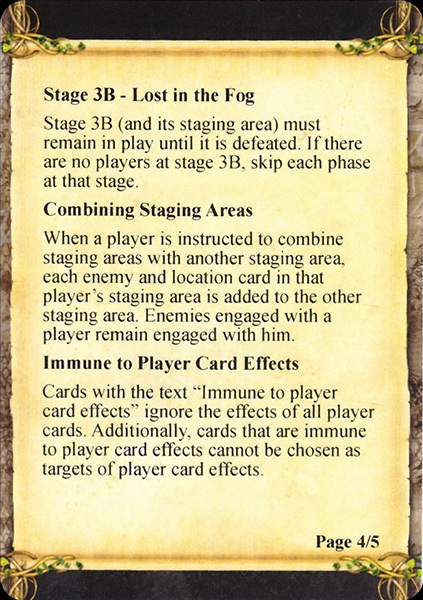 To play Fog on the Barrow-downs in campaign mode, follow the setup instructions found on page 2 of The Black Riders rules insert. Campaign Mode Components Fog on the Barrow-downs expansion includes 2 cards that can only be used when playing the scenario in campaign mode: one double-sided campaign card and one boon card. 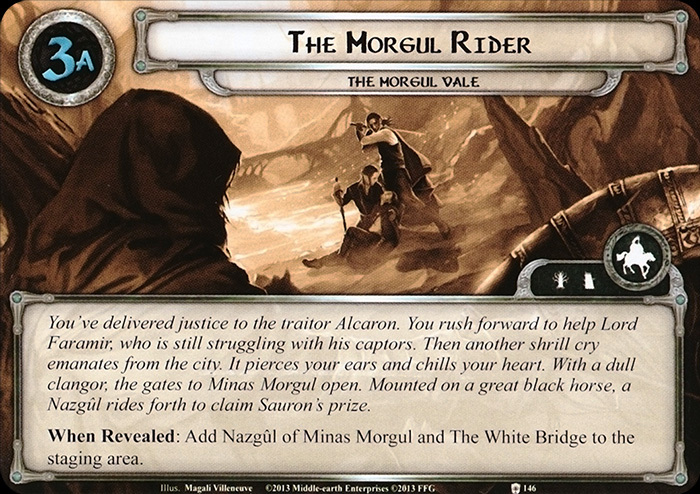 The description for each of these card types can be found on page 4 of The Black Riders rules insert. 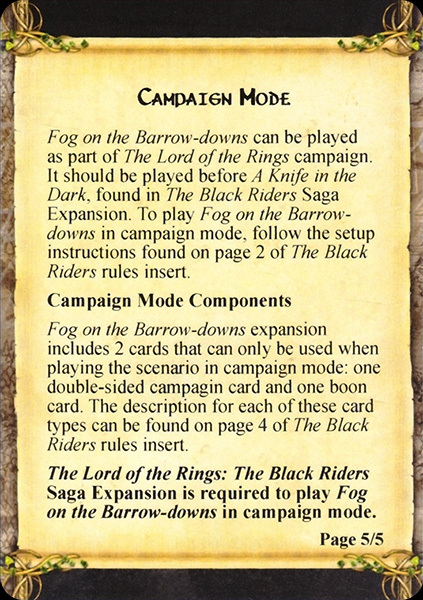 The Lord of the Rings: The Black Riders Saga Expansion is required to play Fog on the Barrow-downs in campaign mode. When Revealed: Add Naurlhûg and Naurlhûg's Lair to the staging area. Shuffle the Sword of Belegost, and the encounter discard pile into the encounter deck. 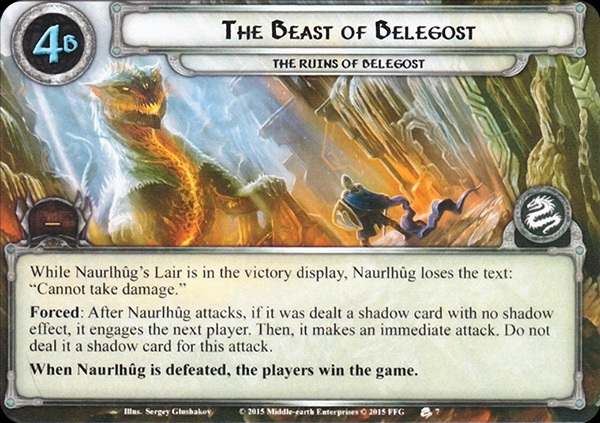 While Naurlhûg's Lair is in the victory display, Naurlhûg loses the text: "Cannot take damage." Forced: After Naurlhûg attacks, if it was dealt a shadow card with no shadow effect, it engages the next player. Then, it makes an immediate attack. Do not deal it a shadow card for this attack. 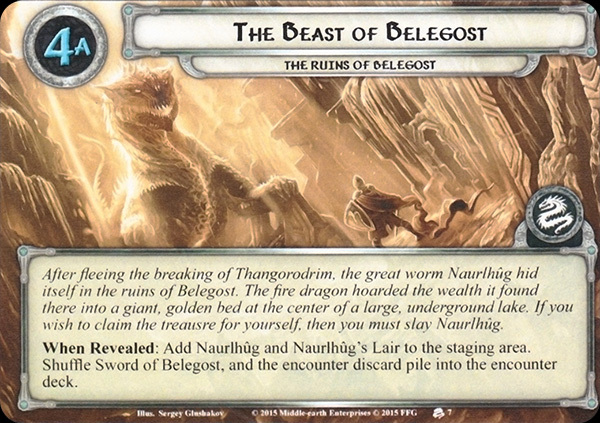 When Naurlhûg is defeated, the players win the game. Setup: Arrange the quest cards into three separate quest decks: 1A-3A, 1C-3C, and 1E-3E. Remove the 1C-3C deck and 1E-3E deck from the game. 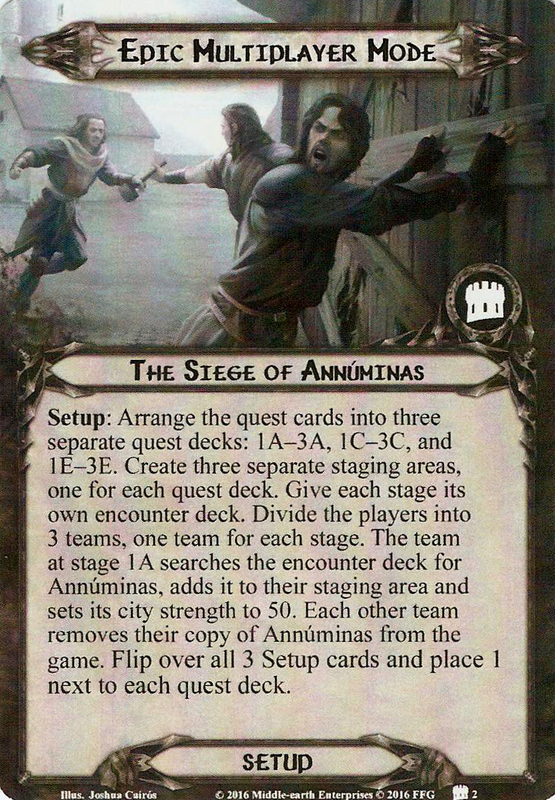 Search the encounter deck for Annúminas, add it to the staging area, and set its city strength to 20. Flip this card over and place it next to the quest deck. 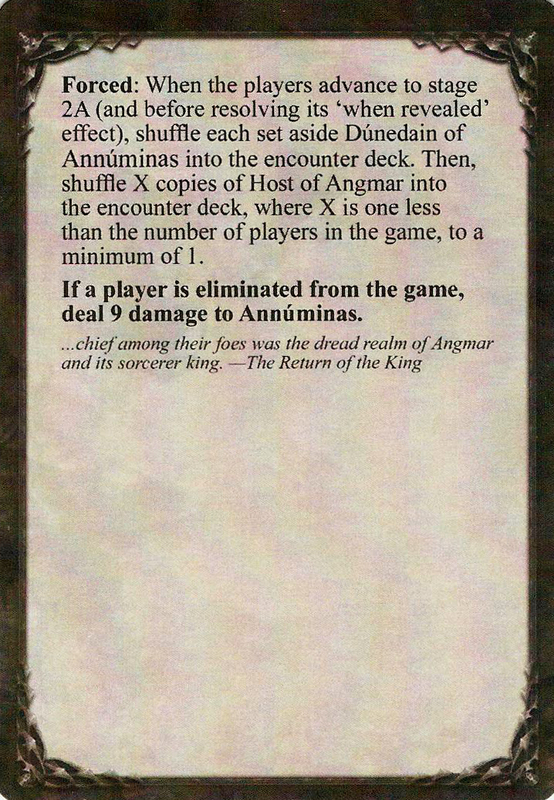 Forced: When the players advance to stage 2A (and before resolving its 'when revealed' effect), shuffle each set aside Dúnedain of Annúminas into the encounter deck. 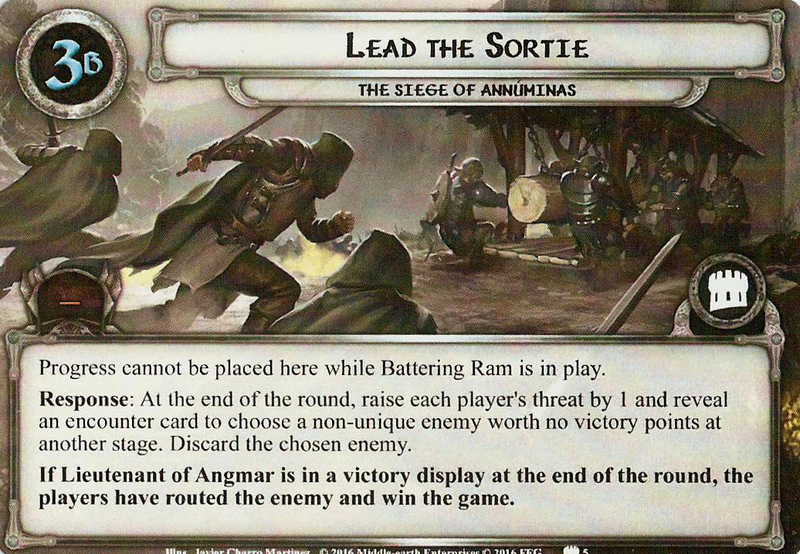 Then shuffle X copies of Host of Angmar into the encounter deck, where X is one less than the number of players in the game, to a minimum of 1. If a player is eliminated from the game, deal 9 damage to Annúminas. Setup: Arrange the quest cards into three separate quest decks: 1A-3A, 1C-3C, and 1E-3E. Create three separate staging area, one for each quest. Give each stage its own encounter deck. Divide the players into 3 teams, one team for each stage. 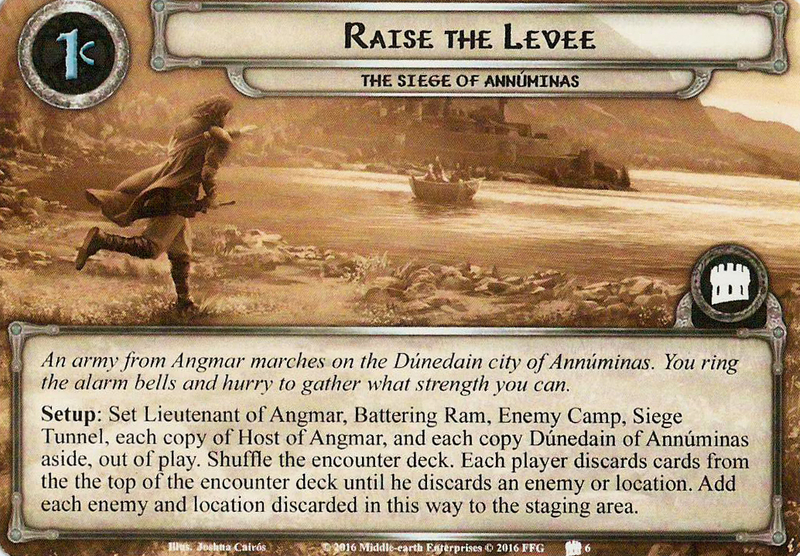 The team at stage 1A searches the encounter deck for Annúminas, adds it to the staging area and sets its city strength to 50. Each other team removes their copy of Annúminas from the game. Flip over all 3 Setup cards and place 1 next to each quest deck. Each stage 2 can only be defeated at the beginning of the round, and only if each other stage 2 is complete. 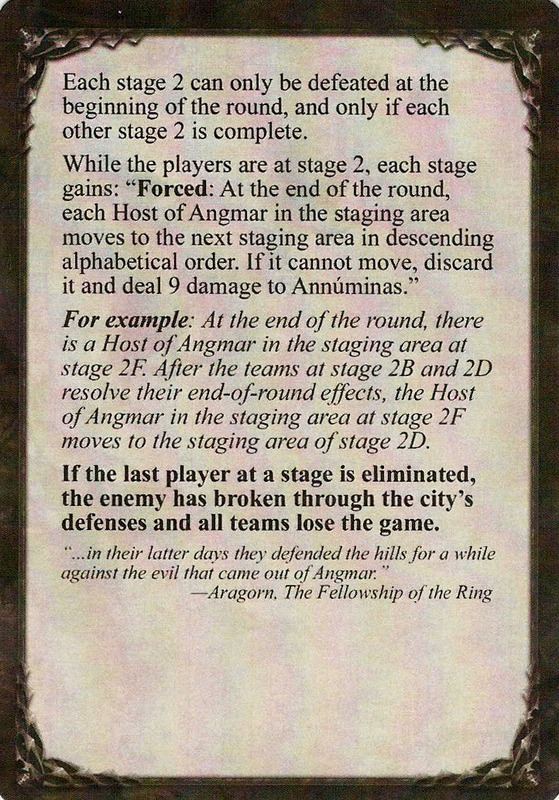 While the players are at stage 2, each stage gains: "Forced: At the end of the round, each Host of Angmar in the staging area moves to the next staging area in descending alphabetical order. If it cannot move, discard it and deal 9 damage to Annúminas." 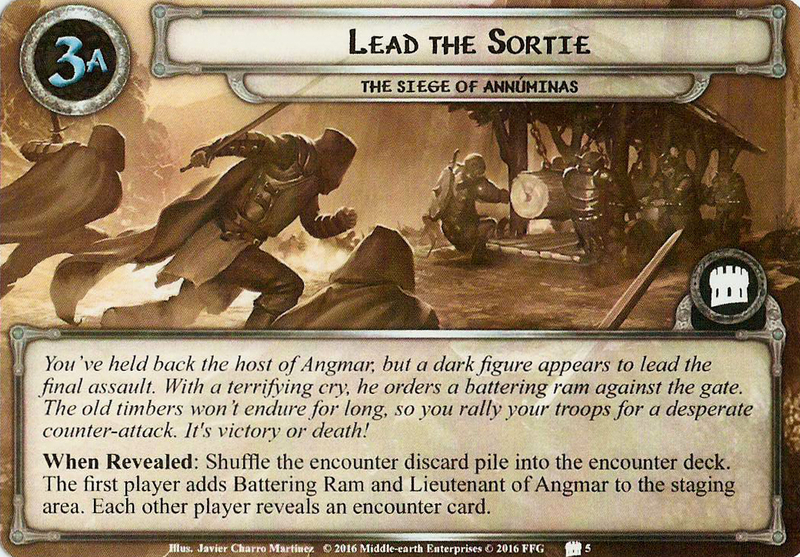 For example: At the end of the round, there is a Host of Angmar in the staging area at stage 2F. After the teams at stage 2B and 2D resolve their end-of-round effects, the Host of Angmar in the staging area at stage 2F moves to the staging area of 2D. If the last player at a stage is eliminated, the enemy has broken through the city's defenses and all teams lose the game. Setup: Set Lieutenant of Angmar, Battering Ram, Enemy Camp, Siege Tunnel, each copy of Host Angmar, and each copy of Dúnedain of Annúminas aside, out of play. Each player searches the encounter deck for a different location and adds it to the staging area. One of those locations must be Gate of Annúminas. Shuffle the encounter deck. Forced: At the beginning of the round (before the resource phase), place 1 resource here. Then, if there are 4 resources here, advance to stage 2. Response: At the end of the round, remove 10 progress from this stage to increase the city strength of Annúminas by 10. When Revealed: Shuffle the encounter discard pile into the encounter deck. The first player adds Battering Ram and Lieutenant of Angmar to the staging area. 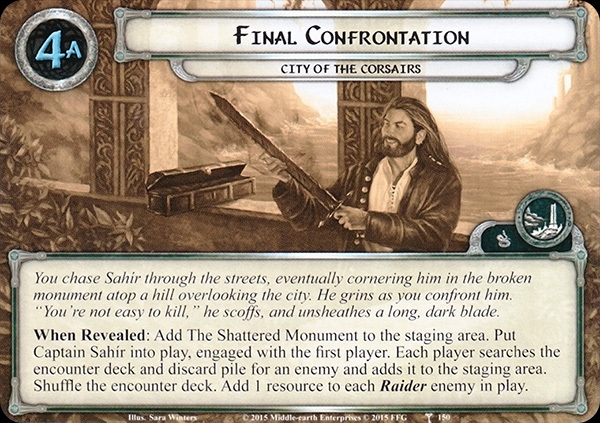 Each player reveals an encounter card. Progress cannot be placed here while Battering Ram is in play. Response: At the end of the round, raise each player's threat by 1 and reveal an encounter card to choose a non-unique enemy worth no victory points at another stage. Discard the chosen enemy. 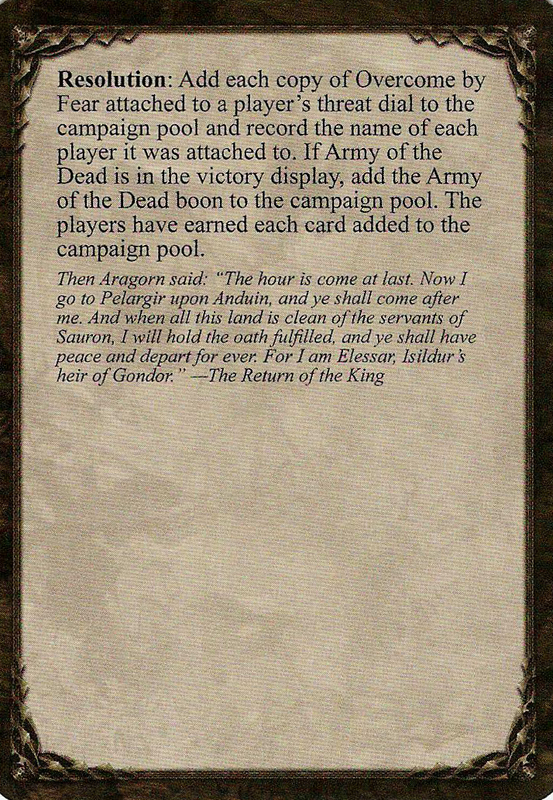 If the Lieutenant of Angmar is in a victory display at the end of the round, the players have routed the enemy and win the game. Setup: Set Lieutenant of Angmar, Battering Ram, Enemy Camp, Siege Tunnel, each copy of Host of Angmar, and each copy of Dúnedain of Annúminas aside, out of play. Shuffle the encounter deck. Each player discards cards from the top of the encounter deck until he discards an enemy or location. Add each enemy and location discarded in this way to the staging area. Forced: At the beginning of the round (before the resource phase), place 1 resource here. Then, if there are 4 resources here, advance to stage 2. Response: At the end of the round, remove 10 progress from this stage. 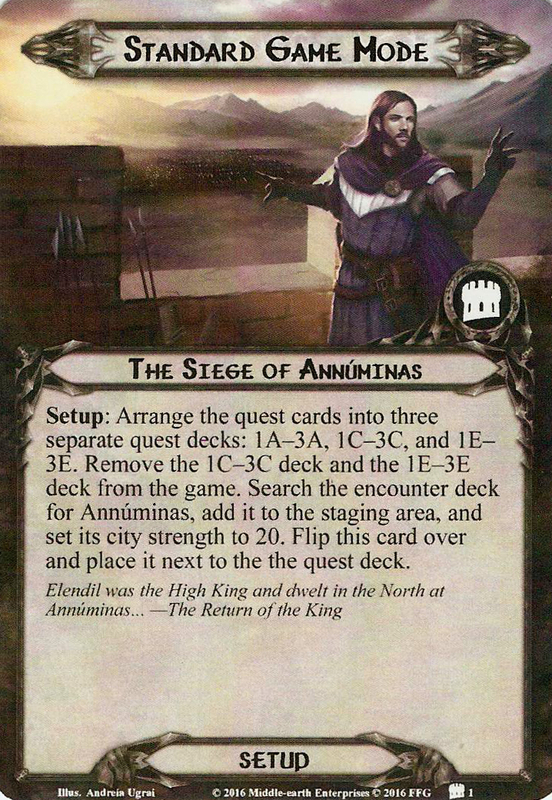 Then, the first player at each stage takes control of a set aside Dúnedain of Annúminas. When Revealed: Remove all tokens from the Lieutenant enemy at this stage and set it aside, out of play. Add the set aside Bane of Amon Lanc to the staging area, unless it is in a victory display. 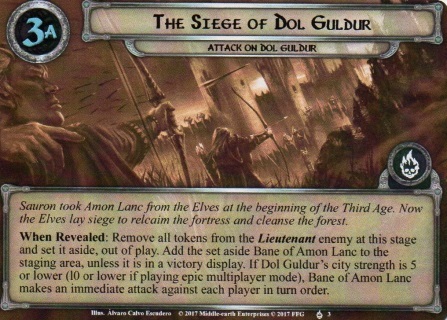 If Dol Guldur's city strength is 5 or lower (10 or lower if playing epic multiplayer mode), Bane of Amon Lanc makes an immediate attack against each player in turn order. Bane of Amon Lanc gets -1 engagement cost for each progress token on this stage. 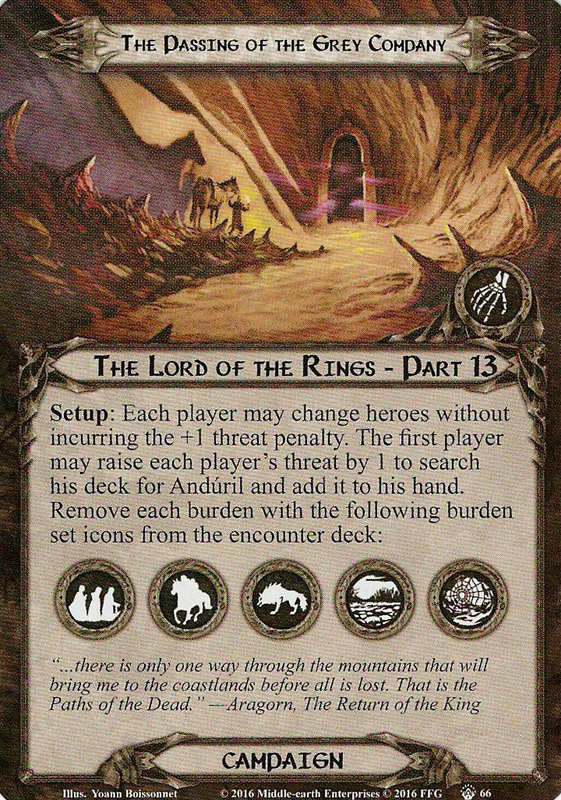 Forced: At the end of the round, remove 5 progress from this stage or increase Dol Guldur's city strength by 3. 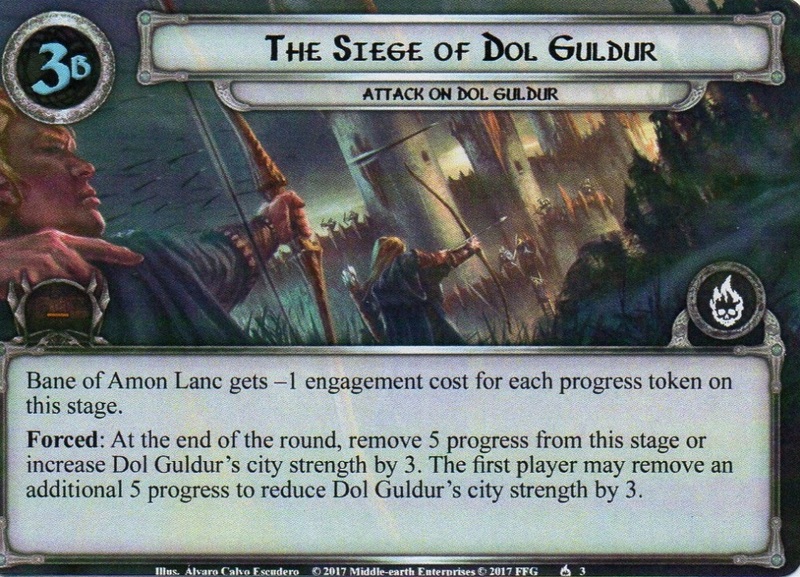 The first player may remove an additional 5 progress to reduce Dol Guldur's city strength by 3. When Revealed: Remove all tokens from the Lieutenant enemy at this stage and set it aside, out of play. 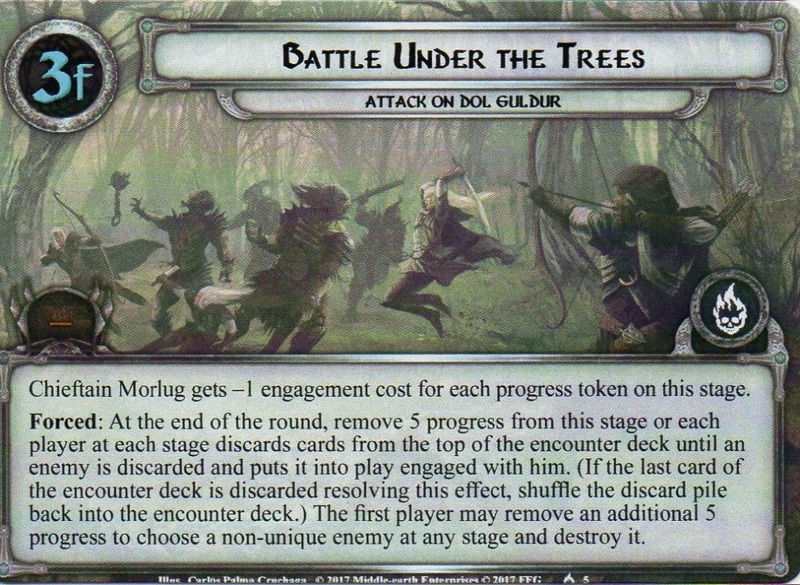 Add the set aside Sorcerer of Dol Guldur to the staging area, unless it is in a victory display. 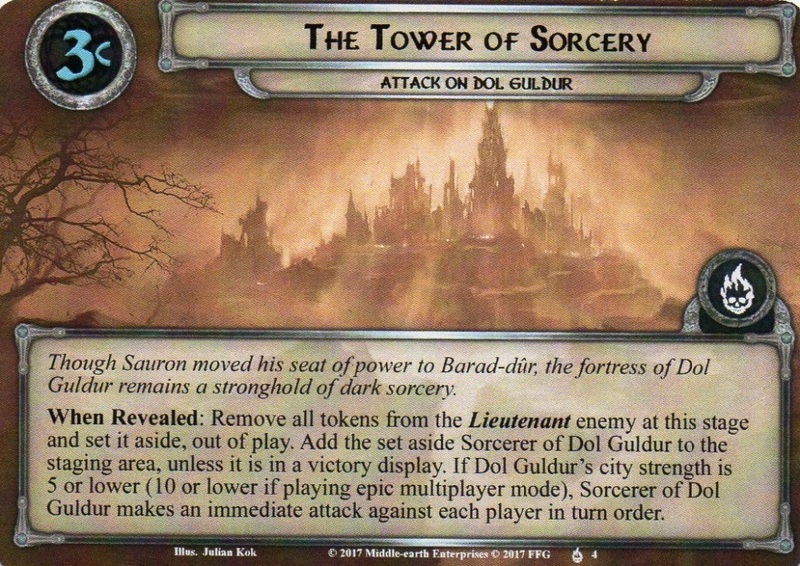 If Dol Guldur's city strength is 5 or lower (10 or lower if playing epic multiplayer mode), Sorcerer of Dol Guldur makes an immediate attack against each player in turn order. 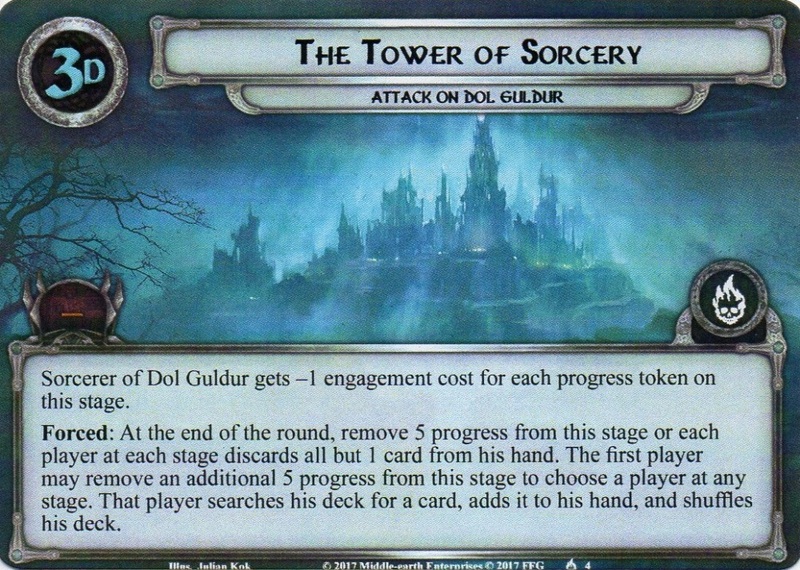 Sorcerer of Dol Guldur gets -1 engagement cost for each progress token on this stage. Forced: At the end of the round, remove 5 progress from this stage or each player at each stage discards all but 1 card from his hand. The first player may remove an additional 5 progress from this stage to choose a player at any stage. That player searches his deck for a card, adds it to his hand, and shuffles his deck. When Revealed: Remove all tokens from the Lieutenant enemy at this stage and set it aside, out of play. Add the set aside Chieftain Morlug to the staging area, unless it is in a victory display. 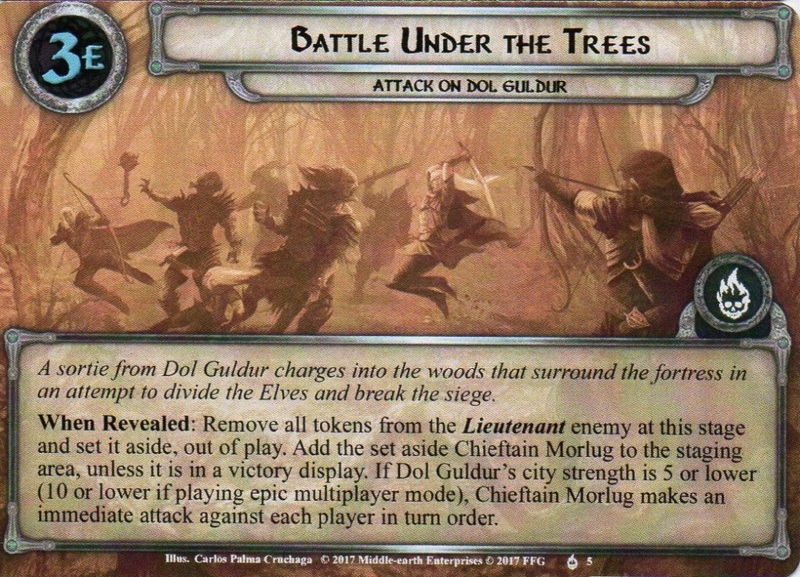 If Dol Guldur's city strength is 5 or lower (10 or lower if playing epic multiplayer mode), Chieftain Morlug makes an immediate attack against each player in turn order. Chieftain Morlug gets -1 engagement cost for each progress token on this stage. Forced: At the end of the round, remove 5 progress from this stage or each player at each stage discards cards from the top of the encounter deck until an enemy is discarded and puts it into play engaged with him. (If the last card of the encounter deck is discarded resolving this effect, shuffle the discard pile back into the encounter deck.) The first player may remove an additional 5 progress from this stage to choose a non-unique enemy at any stage and destroy it. When Revealed: Remove all tokens from the Lieutenant enemy at this stage and set it aside, out of play. Add the set aside Dungeon Dweller to the staging area, unless it is in a victory display. 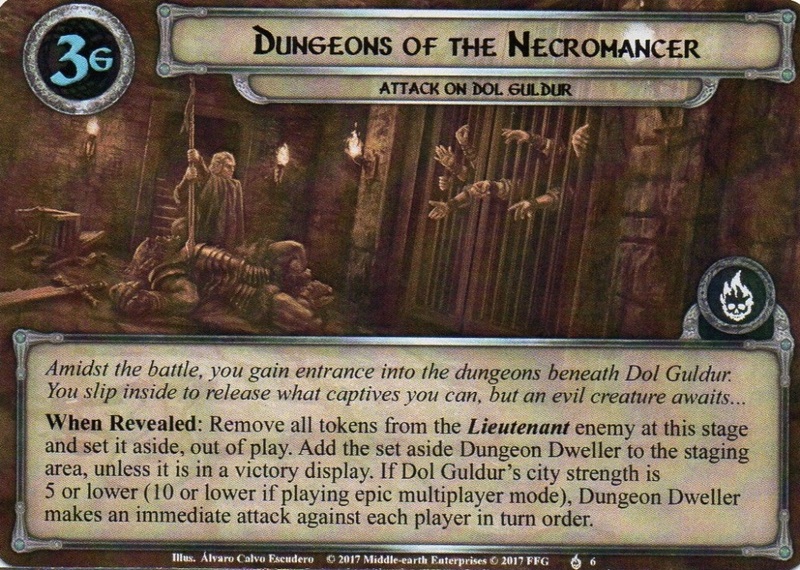 If Dol Guldur's city strength is 5 or lower (10 or lower if playing epic multiplayer mode), Dungeon Dweller makes an immediate attack against each player in turn order. Dungeon Dweller gets -1 engagement cost for each progress token on this stage. Forced: At the end of the round, remove 5 progress from this stage or each player at each stage discards an ally he controls. The first player may remove an additional 5 progress from this stage to choose a player at any stage. That player searches the top 10 cards of his deck for an ally an puts it into play. Immune to player card effects. Forced: When Bane of Amon Lanc attacks you, discard a random card from your hand. Bane of Amon Lanc gets +X Attack for this attack, where X is that card's printed cost. Immune to player card effects. 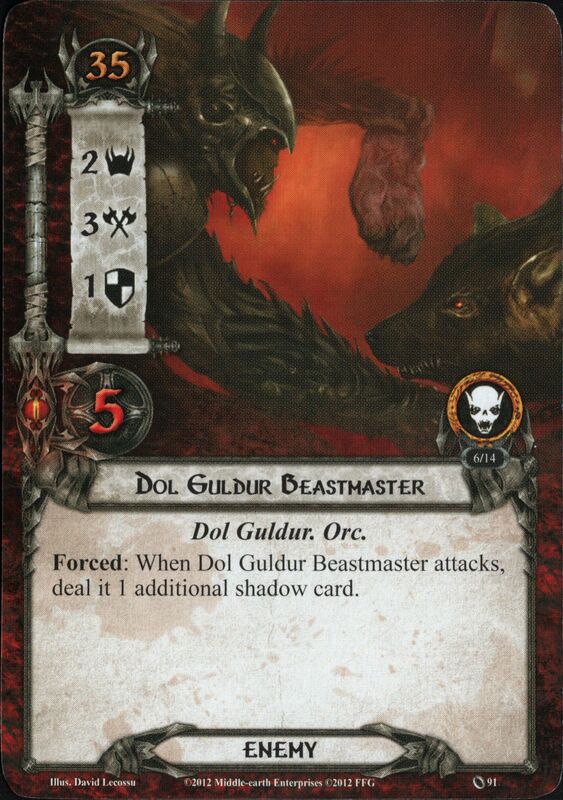 Forced: When Sorcerer of Dol Guldur attacks you, discard the top card of your deck. Then, discard each copy of that card from play. Immune to player card effects. Forced: When Chieftain Morlug attacks you, discard cards from the top of the encounter deck until an enemy is discarded and put it into play engaged with you. Forced: When Dungeon Dweller attacks you, discard an ally you control. Immune to player card effects. X is 1 more than the stage number of the main quest. Cannot leave the staging area unless the players are at stage 3B. Forced: When Primeval Thing enters play, attach cards from the top of the first player's deck to it until the total printed cost of all attached cards is 6 or higher. X is the printed cost of all attached cards on this card. If there are no cards attached, X is 6. You are playing Nightmare mode. Steup: Shuffle each copy of False Accusations into the underworld deck. 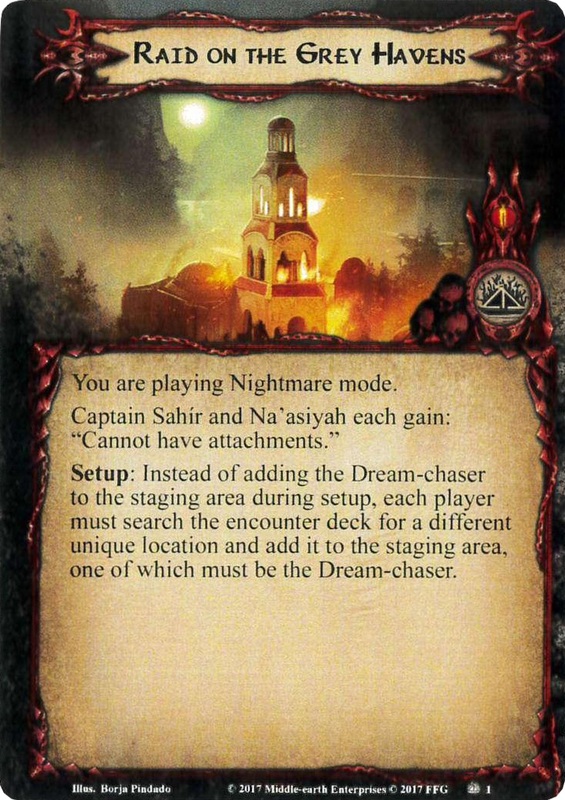 When randomly determining which Plot is the "hidden" plot card, include the 2 new Plot cards from the Nightmare Deck, as well as the 3 Plot cards from the original scenario. Forced: After an enemy is destroyed, shuffle it into the underworld deck if you are not at stage 3. Forced: At the beginning of the refresh phase, if there is a Clue card in the staging area, shuffle it back into the underworld deck. Begin with the standard quest deck and encounter deck for The Steward's Fear scenario. Remove the following cards, in the specified quantities, from the standard encounter deck: 3x Pickpocket 3x Underworld Dissident 2x Storehouse 2x Market Square Then, shuffle the encounter cards in this Nightmare Deck into the remainder of the standard The Steward's Fear encounter deck. Finally, flip this setup card over and place it next to the quest deck. Its effects remain active throughout the game, which is now ready to begin. 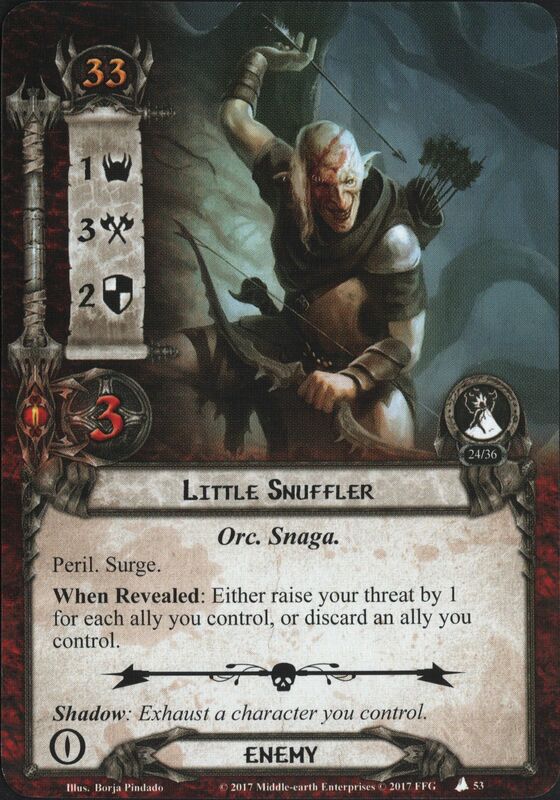 When Revealed: Trigger Little Snuffler's Scour effect. 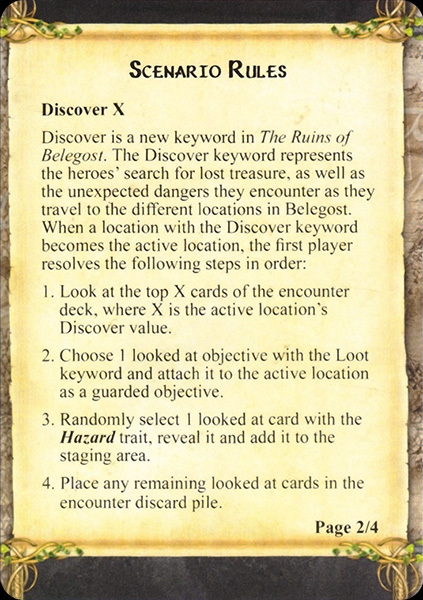 Scour: The first player discards a random card from his hand and assigns X damage among locations in the staging area. X is the discarded card's cost. You are playing Nightmare mode. 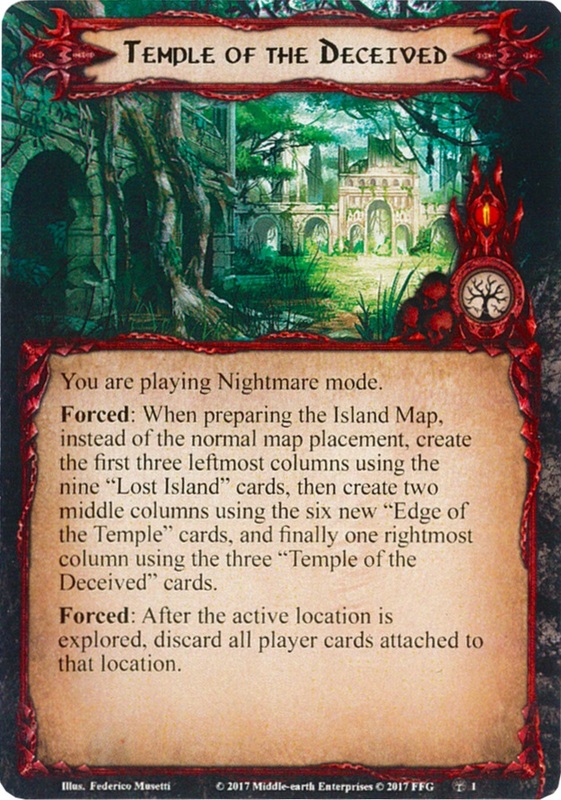 Forced: When preparing the Island Map, instead of the normal map placement, create the first three leftmost columns using the nine "Lost Island" cards, then create two middle columns using the siz new "Edge of the Temple" cards, and finally one rightmost column using the three "Temple of the Deceived" cards. Forced: After the active location is explored, discard all player cards attached to that location. 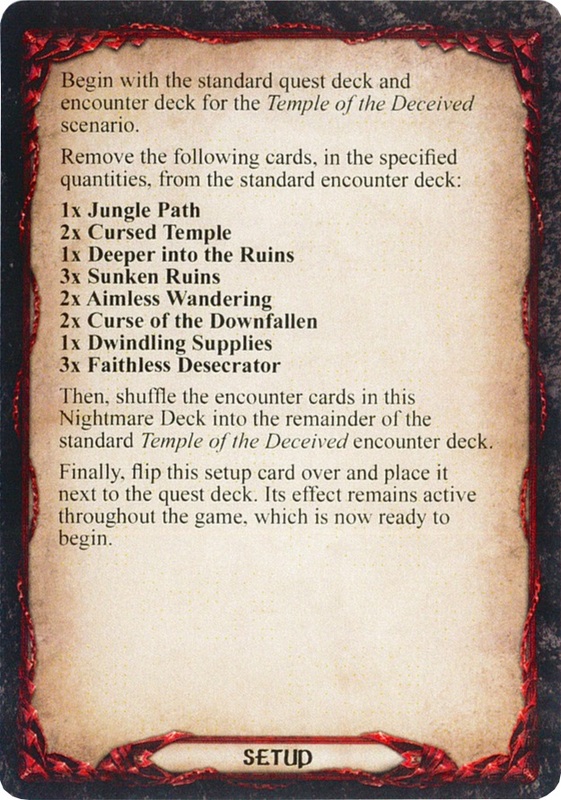 Begin with the standard quest deck and encounter deck for the Temple of the Deceived scenario.\r\nRemove the following cards, in the specified quantities, from the standard encounter deck: 1x Jungle Path 2x Cursed Temple 1x Deeper into the Ruins 3x Sunken Ruins 2x Aimless Wandering 2x Curse of the Downfallen 1x Dwindling Supplies 3x Faithless Desecrator Then shuffle the encounter cards in this Nightmare Deck into the remainder of the standard Temple of the Deceived encounter deck. Finally, flip this setup card over and place it next to the quest deck. Its effect remains active throughout the game, which is now ready to begin. Cannot have non-Morgul attachments. Khamûl the Easterling gets -30 engagement cost while The One Ring is exhausted. Forced: At the beginning of the refresh phase, the engaged player makes a Hide 2 test. If the engaged player fails the hide test, Khamûl the Easterling makes an immediate attack. Cannot have non-Morgul attachments. While Dark Horseman is engaged with you, characters you control get -1 Willpower during Hide tests. Cannot have non-Morgul attachments. Forced: After Fell Rider attacks and destroys a character, reduce the Ring-bearer's life by 1. Shadow: Attacking enemy gets +1 Attack (+2 Attack instead if The One Ring is exhausted). You are playing Nightmare mode. Do not discard unresolved shadow cards from Shelob at the end of the combat phase. While Cleft of Cirith Ungol is in the staging area, players cannot travel to locations not named Cleft of Cirith Ungol. 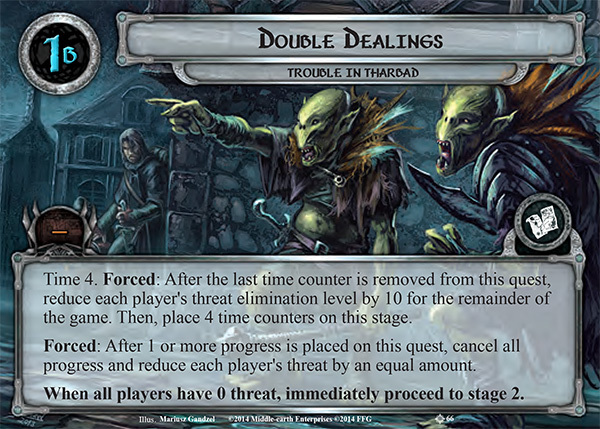 Begin with the standard quest deck and encounter deck for the Shelob's Lair scenario. 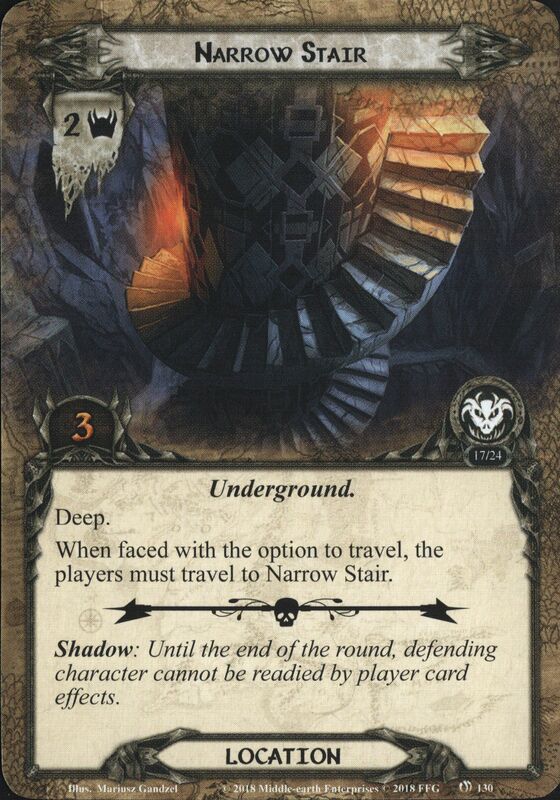 Remove the following cards, in the specified quantities, from the standard encounter deck: 4x Mogul Orc 2x The Under-way 3x Deep Dark Passage 2x Many Openings Then, shuffle the encounter cards in this Nightmare Deck into the remainder of the standard Shelob's Lair encounter deck. Finally, flip this setup card over and place it next to the quest deck. Its effect remains active throughout the game, which is now ready to begin. Attach to a hero you control. Attached hero collects 1 additional resource during the resource phase each round. Play Ranger Spikes into the staging area unattached.If unattached, attach Ranger Spikes to the next eligible enemy that enters the staging area.Players do not make engagement checks against attached enemy. Attached enemy gets -2 Threat. Action: Name a sphere. Until the end of the phase, you can spend resources of any sphere when paying for cards that belong to the named sphere. Draw 3 additional cards at the beginning of the resource phase. At the end of the round, discard all cards in your hand. Play Entagling Nets into the staging area, unattached. If unattached, attach Entangling Nets to the next eligible enemy that enters the staging area. Attached enemy gets -2 Attack and -2 Defense. Attach to a Ranger hero. Response: After attached hero commits to a quest, name enemy, location or treachery. 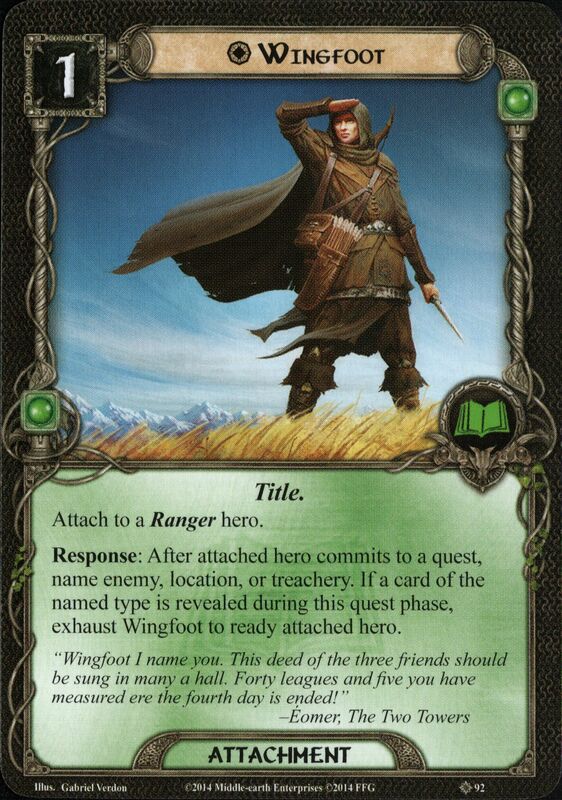 If a card of the named type is revealed during this quest phase, exhaust Wingfoot to ready attached hero. If you control at least 5 Dwarf characters, add 1 additional resource to Thorin Oakenshield's pool when you collect resources during the resource phase. While you are engaged with at least 1 enemy, Amarthiúl gains the Tactics resource icon. While you are engaged with at least 2 enemies, add 1 additional resource to Amarthiúl's resource pool when you collect resources during the resource phase. If you control at least 5 Dwarf characters, draw 1 additional card at the beginning of the resource phase. While you are engaged with any enemy, Halbarad does not exhaust to commit to a quest. You may optionally engage 1 additional enemy during the encounter phase. Play Poisoned Stakes into the staging area unattached. If unattached, attach Poisoned Stakes to the next eligble enemy that enters the staging area. At the end of each round, deal 2 damage to attached enemy. Response: After Weather Hills Watchman enters play, search the top 5 cards of your deck for a Signal card and add it to your hand. Shuffle the other cards back into your deck. Play Ithilien Pit into the staging area unattached. If unattached, attach Ithilien Pit to the next eligible enemy that enters the staging area. Any character may choose attached enemy as the target of an attack. Attach to a Dúnedain hero. 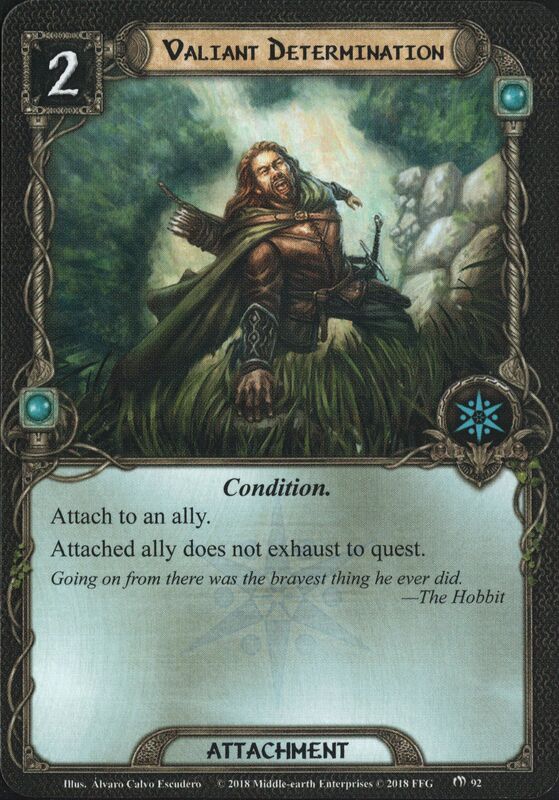 If the attached hero is Aragorn, he gains a Tactics icon. Response: After you optionally engage an enemy, exhaust Roheryn and attached hero to declare attached hero as an attacker (and resolve its attack) against that eneny. While Elrohir is in play, Elladan gets +2 Attack. Response: After you optionally engage an Orc enemy, ready Elladan. Attach to a Ranger or Leadership hero. Response: After a Signal attachment is attached to a hero, exhaust Rune-master to add 1 resource to that hero's resource pool. Limit 1 copy of Prepare for Battle in the victory display. While this quest is in the victory display, the first player draws an additional card during the resource phase. Attach to the Ring-bearer. Limit 1 per hero. While an Orc is making an enagement check with you, it gets +5 engagement cost. Response: After an Orc engages you, discard Orc Disguise. Until the end of the round, that enemy cannot attack you. Play into your play area unattached. While unattached, attach to the next eligible enemy that engages you. While attached enemy is engaged with you, reduce the total Threat in the staging area by X, where X is attached enemy's printed Threat. Attach to Prince Imrahil. Price Imrahil gains the Outlands trait. While you control Outlands allies that belong to 4 different spheres, add 1 additional resource to Prince Imrahil's resource pool when you collect resources during the resource phase (if Prince Imrahil is a hero). As an additional cost to play Skyward Volley, exhaust a ranged character you control. Combat Action: Deal 2 damage to an enemy engaged with a player. Resolve that effect again for each copy of Skyward Volley currently in your discard pile (you may choose different targets). Action: Exhaust Master of Lore to name a card type. Lower the cost for you to play the next Lore card of that type by 1 until the end of the phase (to a minimum of 1). Play only after making engagement checks. Encounter Action: If no enemies were engaged this phase, deal 1 damage to each enemy in the staging area. Then, the players as a group may spend 3 Tactics resources to deal 2 additional damage to each enemy in the staging area. Response: Exhaust a Dúnedain or Ranger hero to cancel an enemy card just revealed from the encounter deck. Then, shuffle it back into the encounter deck and reveal an additional encounter card. Limit 1 per deck. Planning Action: Add Justice Shall Be Done to the victory display to draw 3 cards and add 3 resources to the resource pool of each hero you control. At the end of the round, you are eliminated from the game. Play into your play area unattached. If unattached, attach to the next eligible enemy that engages you. Response: After attached enemy resolves its attack, ready the defending character. During the encounter phase, players cannot optionally engage Goblin Sniper if there are other enemies in the staging area.Forced: If Goblin Sniper is in the staging area at the end of the combat phase, each player deals 1 point of damage to 1 character he controls. When Revealed: Reveal X additional cards from the encounter deck. X is the number of players in the game. Shadow: Deal X shadow cards to this attacker. X is the number of players in the game. Forced: While Gladden Fields is the active location, each player must raise his threat by an additional point during the refresh phase. 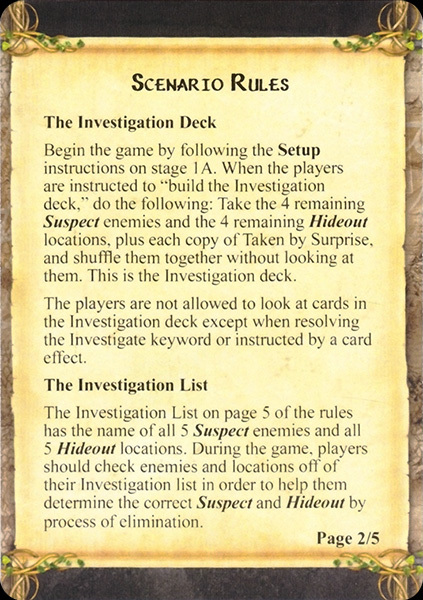 Setup: Search the encounter deck for the 3 objective cards, reveal and place them in the staging area. 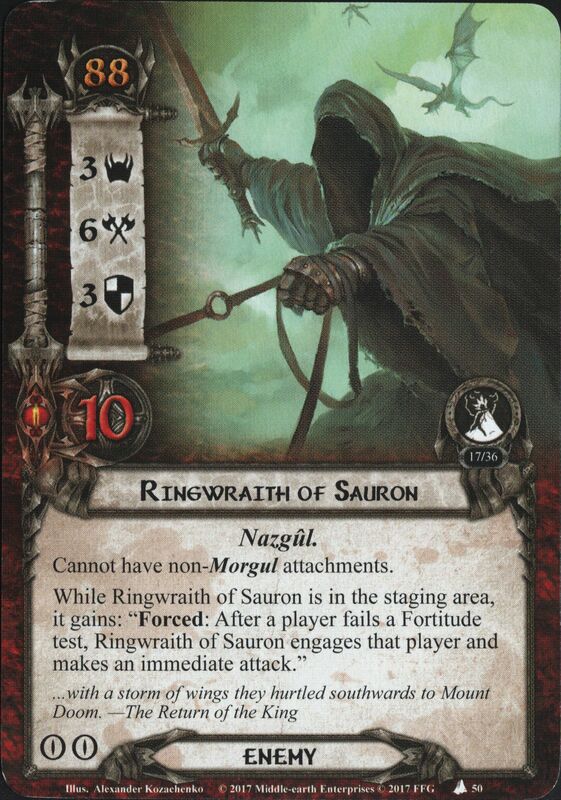 Also, place the Nazgul of Dol Guldur face up but out of play, alongside the quest deck. 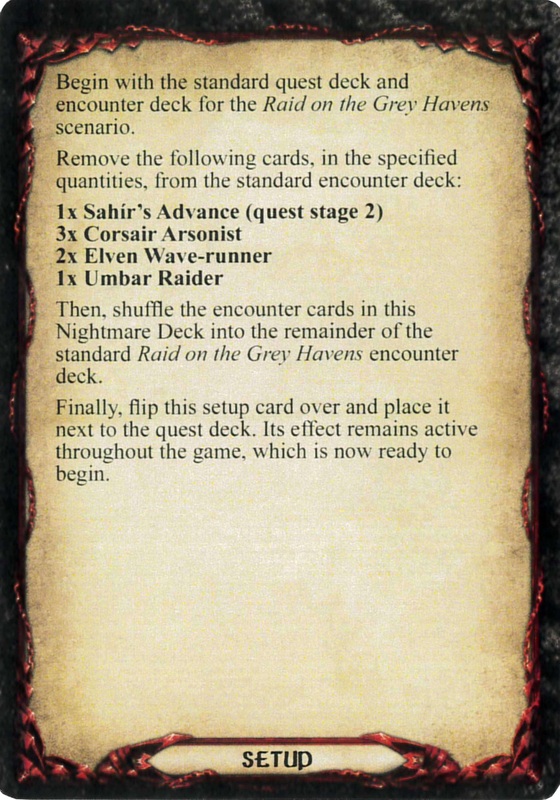 Then, shuffle the encounter deck, and attach 1 encounter to each objective card. When Revealed: Randomly select 1 hero card (among all the heroes controlled by the players) and turn it facedown. 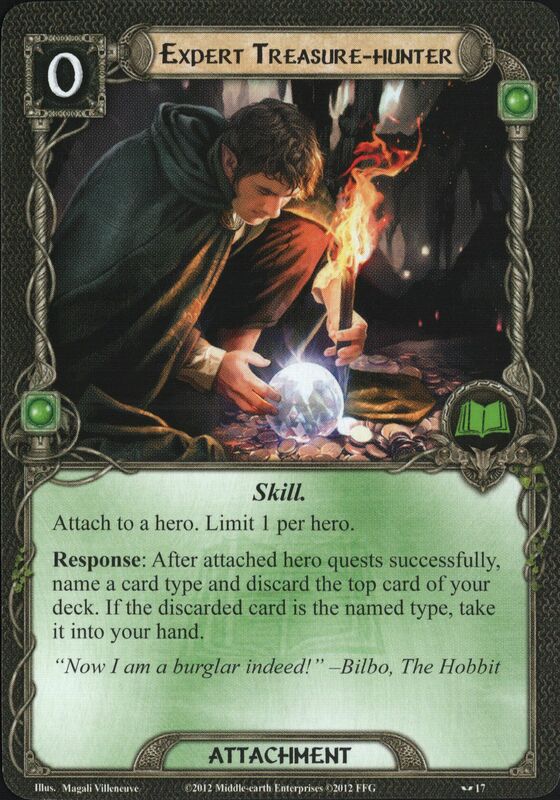 The hero is now considered a "prisoner", cannot be used, cannot be damaged, and does not collect resources, until it is "rescued" (as instructed by card effects) later in this quest. The players, as a group, cannot play more than 1 ally card each round. 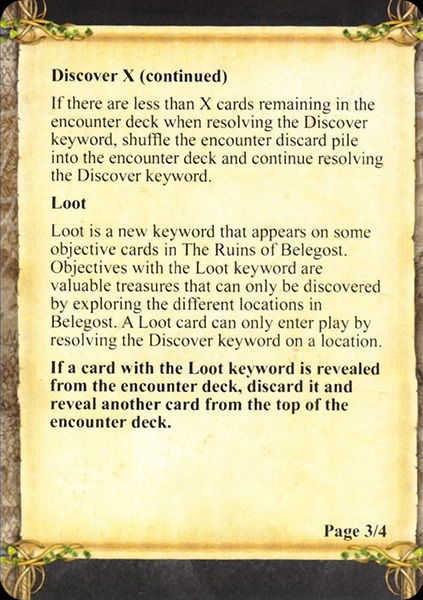 Players cannot advance to the next stage of this quest unless they have at least 1 objective card. Forced: At the beginning of each quest phase, each player places the top card of his deck, face down in front of him as if it just engaged him from the staging area. These cards are called "Orc Guard" and act as enemies with: 1 hit point, 1 Attack, and 1 Defense. Players cannot defeat this stage while Nazgul of Dol Guldur is in play. If this stage is defeated and Nazgul of Dol Guldur is not in play, the players have won the game. 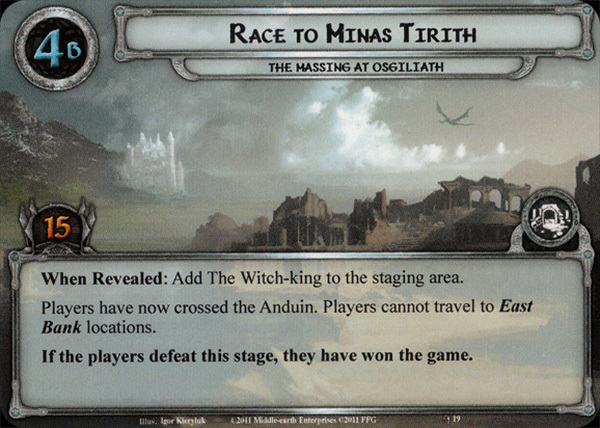 While The East Wall of Rohan is the active location, non-Rohan characters cost 2 additional matching resources to play. Forced: After this stage is defeated, the first player chooses a player. 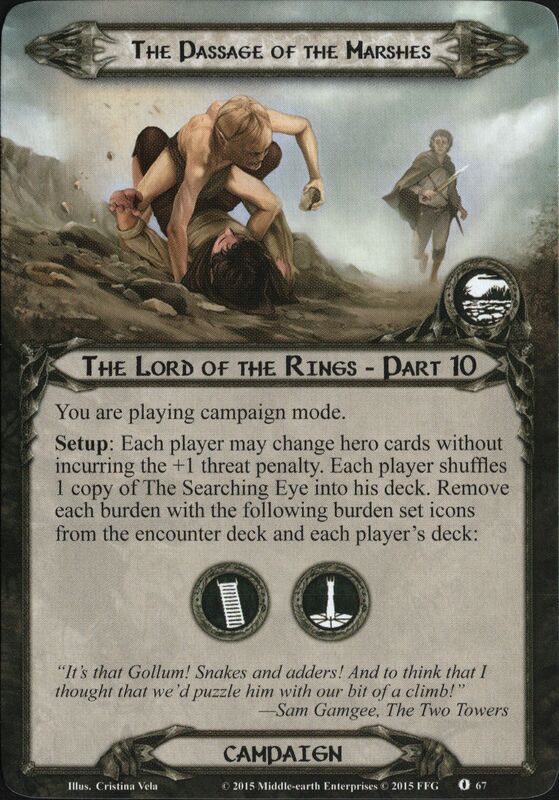 That player must pass an Escape test, dealing 1 card from the encounter deck for each resource token on Gollum, to capture him. 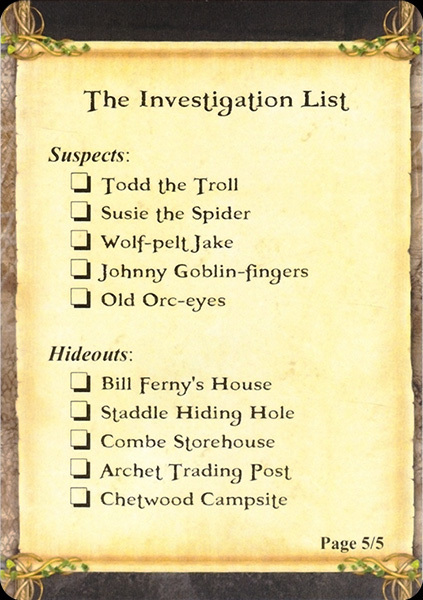 If Gollum is not captured at this time, reset the quest deck to stage 1B. 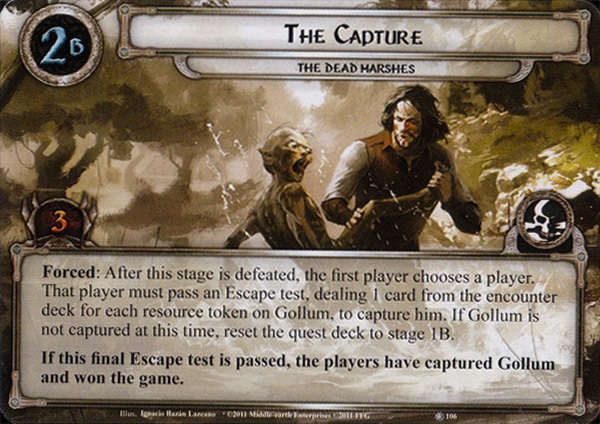 If this final Escape test is passed, the players have captured Gollum and won the game.